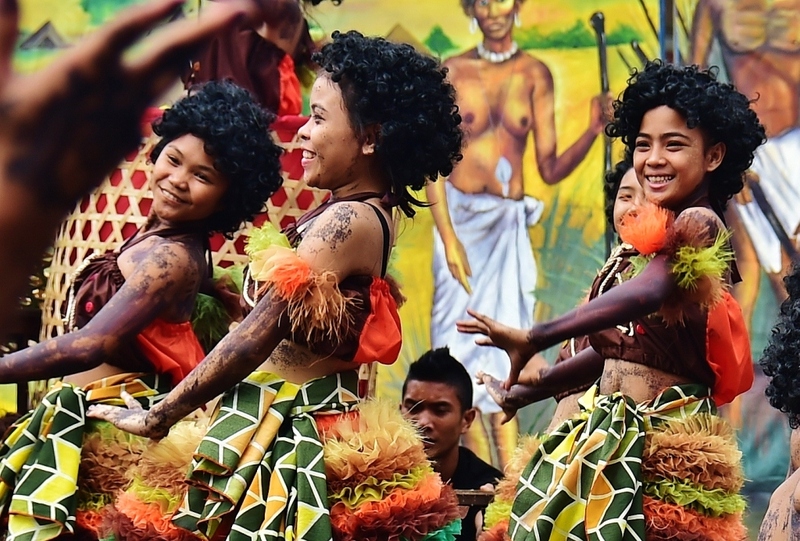 Visayas is the collective name for all the islands in the middle part of the Philippines. 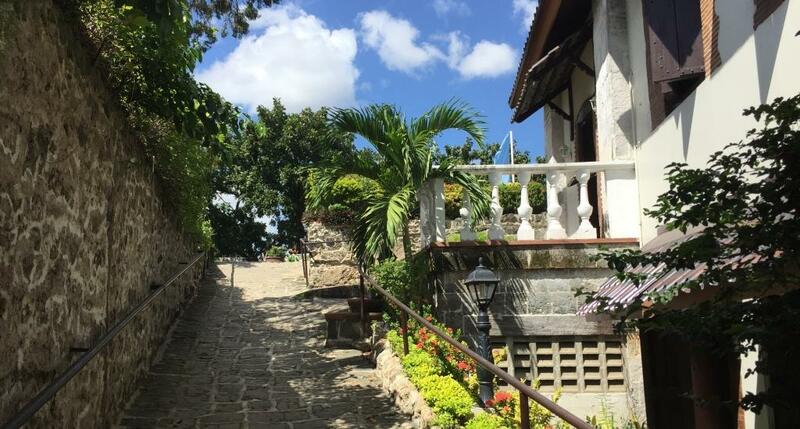 The most famous is Cebu, where the oldest city in the Philippines, Cebu City, is located. 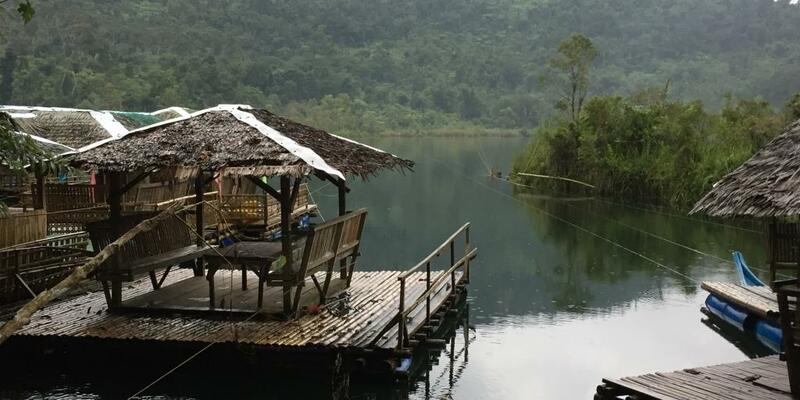 Nestled at 1,033 feet above sea level, Lake Danao is the largest lake in Leyte Province. 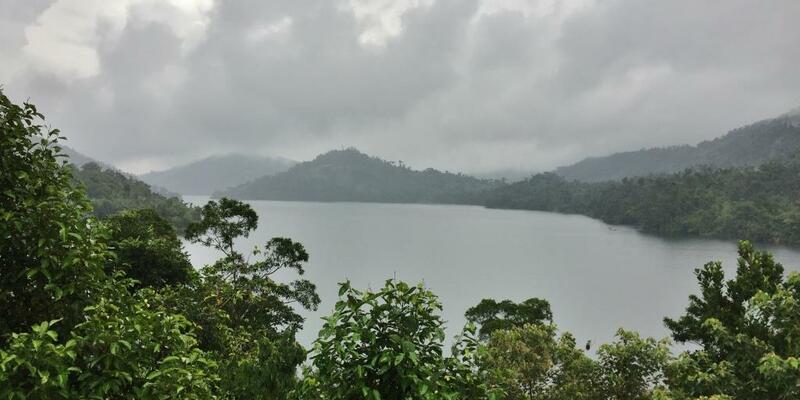 We went to the lake courtesy of a friend who brought us there on a sturdy Isuzu DMAX. 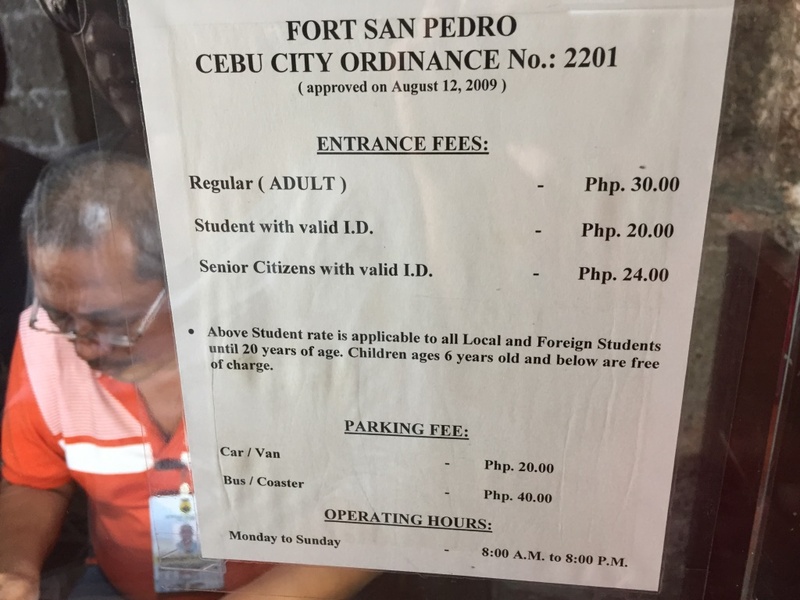 But those who do not have private transportation can either arrange for a habal habal (back-riding on a motorbike) from Ormoc proper, or rent a jeepney or a multicab. 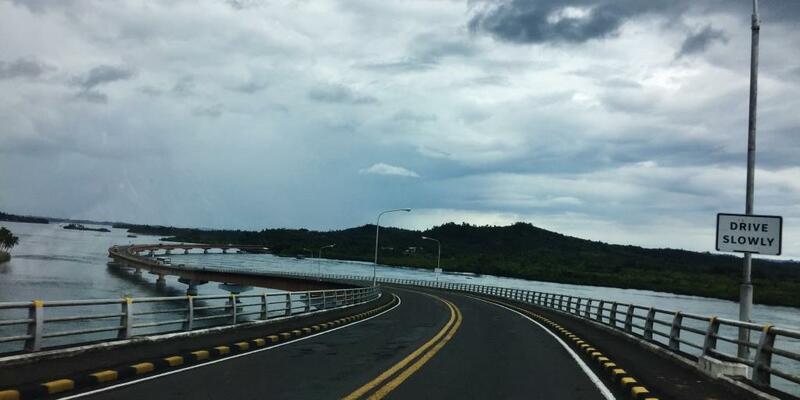 Travel to the lake from Ormoc City is 15-20 minutes on a winding uphill road. There is a viewing deck on top of the hill. 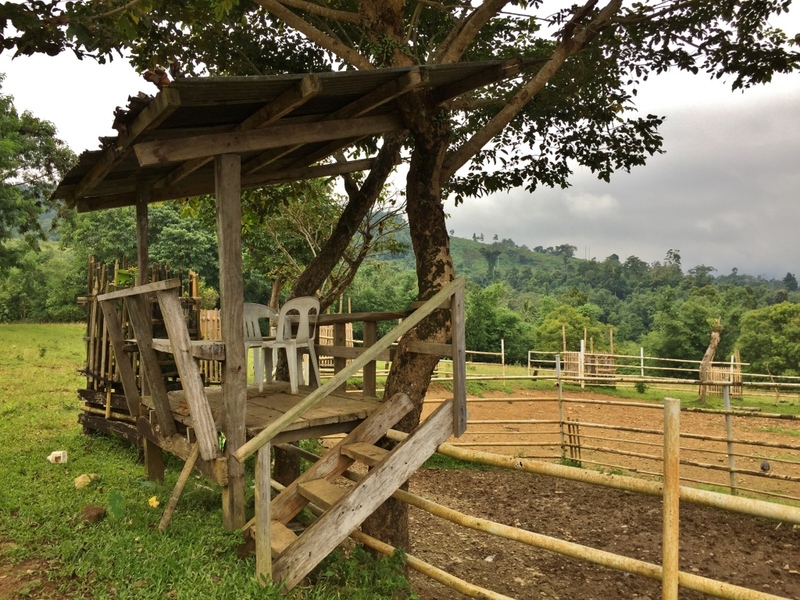 Across from the view deck is an office for Forestry students of the Visayas State University. The viewing deck has three levels. The ground level is essentially a patio style structure where one will not have a view of the lake because of the trees and shrubs blocking the vista. I imagine that, once developed, this will be a perfect spot for coffee, especially when the trees and the shrubs are trimmed. 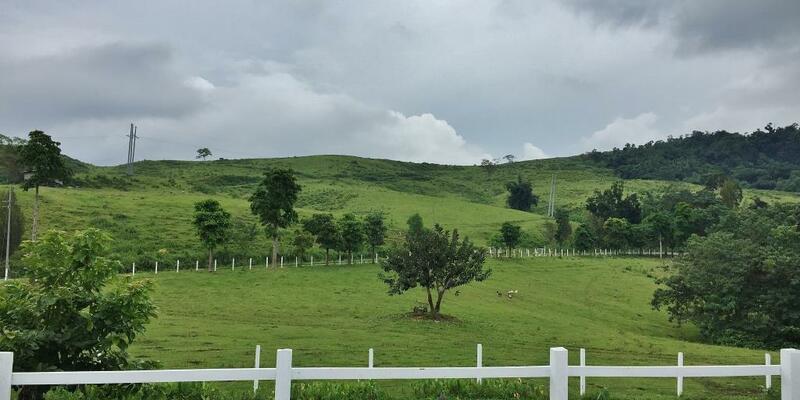 Imagine having coffee al fresco with such a great view. 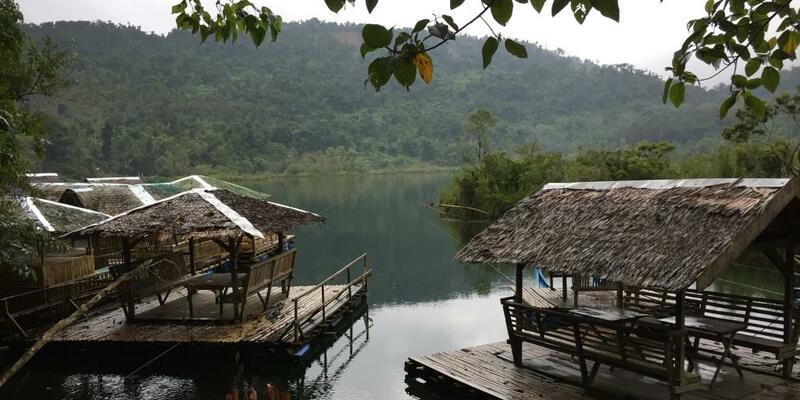 Downhill, guests have access to many cottages on rafts that can be rented for picnics. Guest bring their own barbecues, or arrange with locals. Some guests I figure would enjoy fishing, or even a cold swim. And kayaking. Camping can be arranged. Pity that the place seems to have been neglected. 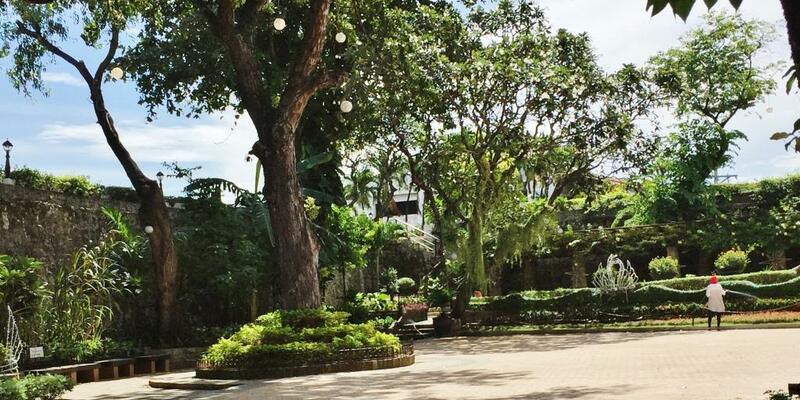 I found out that the park is under the DENR, a national government office. 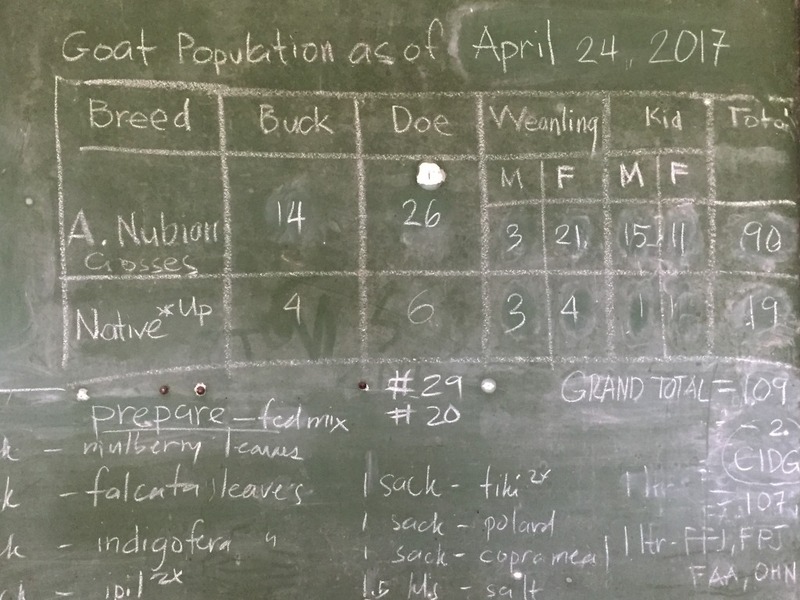 But if only the city of Ormoc and the national government strike a partnership, the city of Ormoc can benefit immensely, and have Lake Danao as its top tourist draw. I am an advertising person. 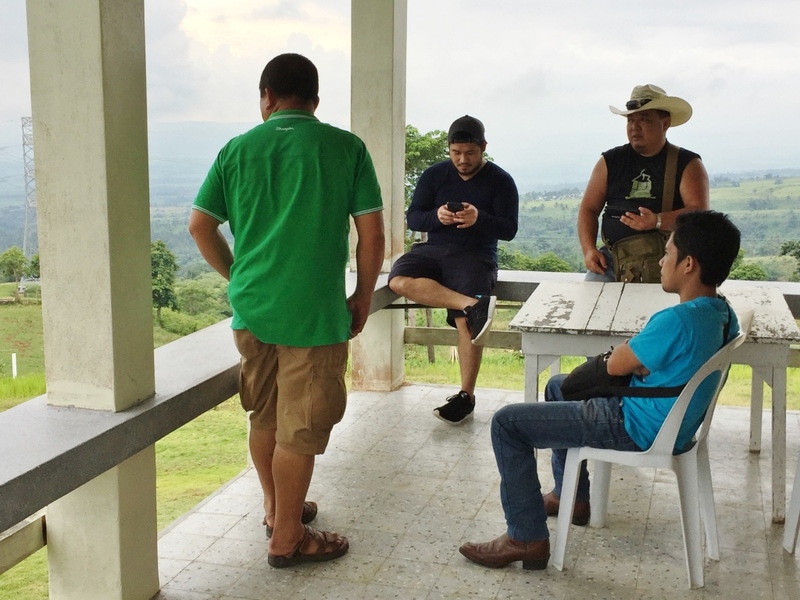 While there, I couldn’t resist the idea of shooting the mayor, actor Richard Gomez while rowing on the lake, with his beautiful wife, Congresswoman Lucy Torres, watching him while having coffee at the viewing deck on the hill. Tight and panoramic shots. And visions of Richard in the now classic BENCH tv commercial. This can be done and exposed only online, as advertising on TV will be expensive and may not be easily recovered with revenues from a small city destination. Who knows? I have been to Tacloban many times before. 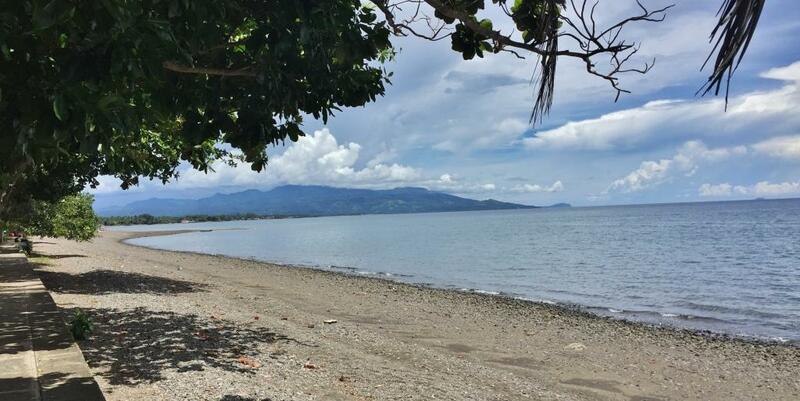 But I am visiting Tacloban for the first time after it was devastated by Typhoon Yolanda (Haiyan) a few years ago. Local and internationl aid poured in. Government and the private sector joined hands in its rehabilitation. And today, I saw no signs of the havoc I was then seeing on TV. I used to stay at Leyte Park Hotel. 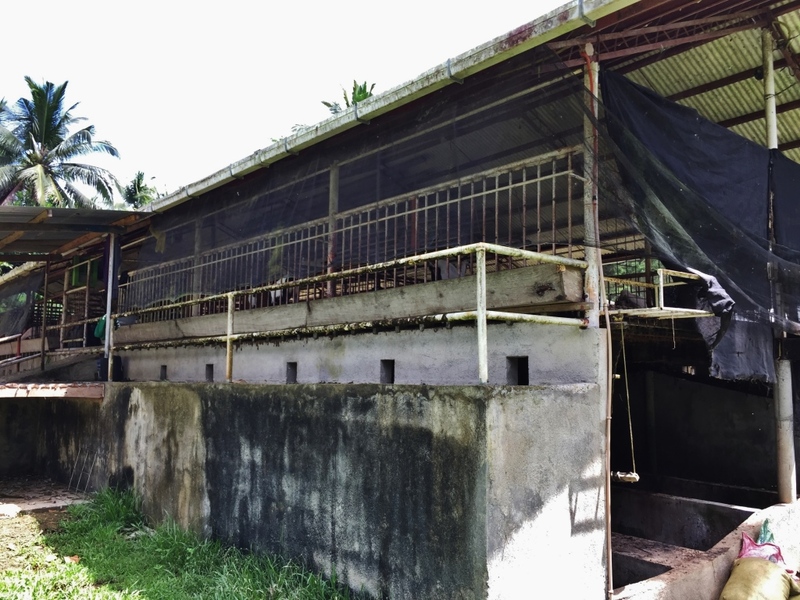 But even on a previous trip prior to Yolanda, I got disappointed with its state of disrepair, so I checked into another hotel then. That nice hotel, I understand, did not escape Yolanda’s fury. 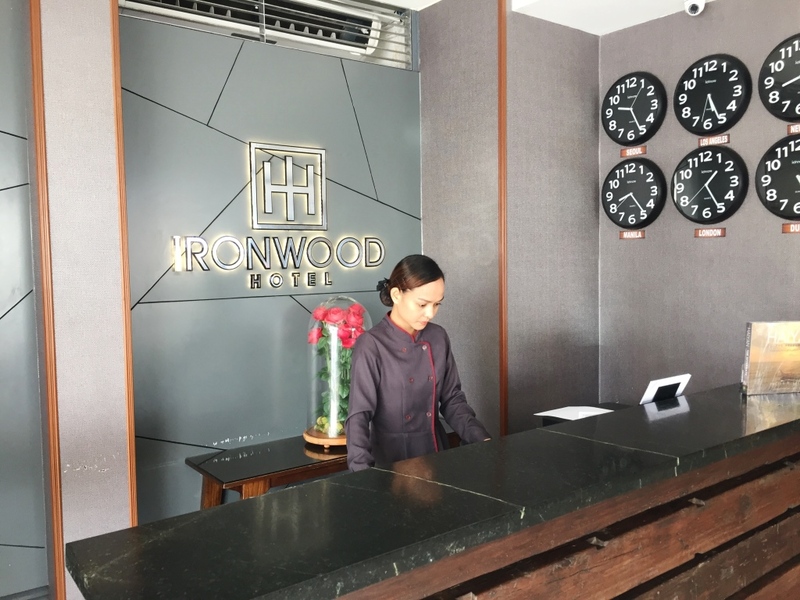 And so I was pleasantly surprised finding Ironwood, from my research of the best Tacloban Hotels. And Ironwood did not disappoint. 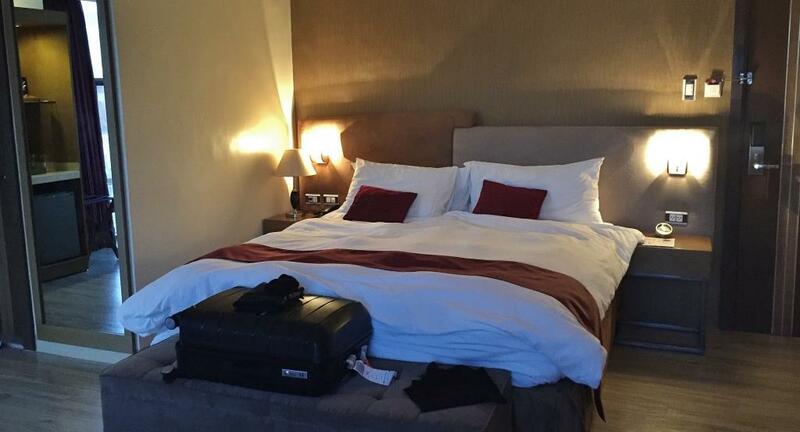 Before the trip, I booked the hotel’s biggest room, an executive suite at the corner. As I pulled the drapes, I had Tacloban streets below me. The room was of good size and accommodated an extra bed which I ordered for the rodeo players who fetched me at the airport (we rode the Ironwood Hotel van). The room had a ref with drinks and a bar with snacks charged per consumption. Toiletries were sufficient. The room also had a safe. Everything I expected from a high-standard hotel. We checked out the 5th Floor open terrace and had beer. 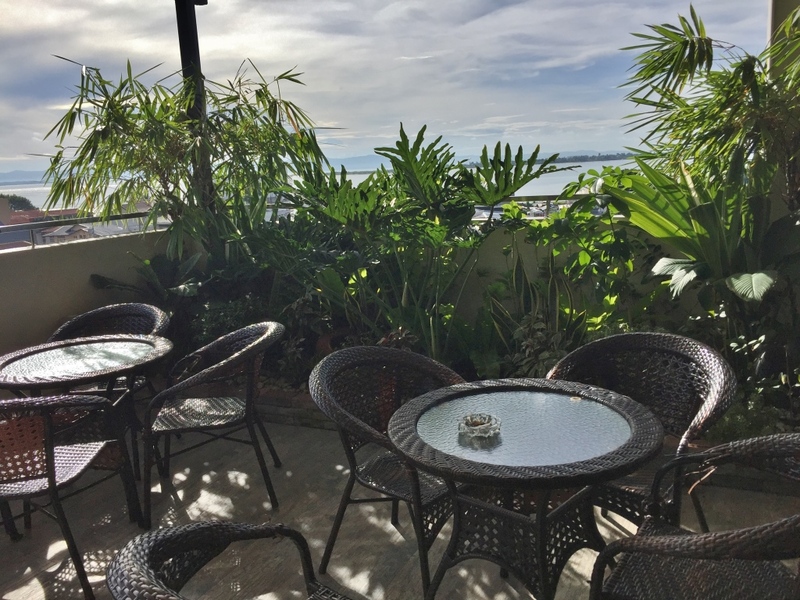 The place is also the hotel’s smoking area as the city prohibits smoking in public (and the hotel of course disallows smoking in rooms and in the hotel’s public areas). Breakfast was included in the room rate, as well as complimentary wifi. Breakfast was buffet on my first stay. But plated when I returned as buffet was not going to be cost-efficient for the hotel when the rooms are not all taken. I actually returned to Ironwood a few days later. That pretty much sums up the satisfaction I experienced with this hotel. 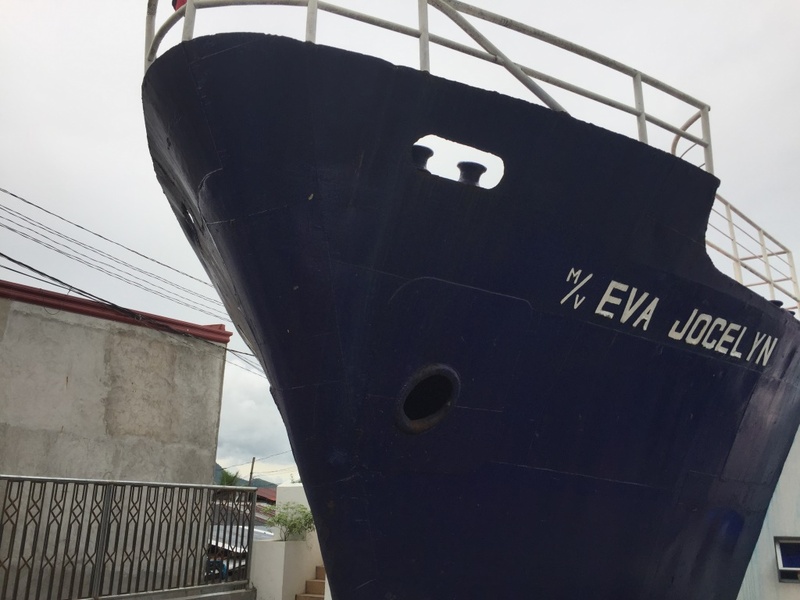 Except for the ship ran aground that stays as a tourist attraction in Barangay Anibong, visitors will not find any trace of the devastation typhoon Yolanda brought to Tacloban years ago. 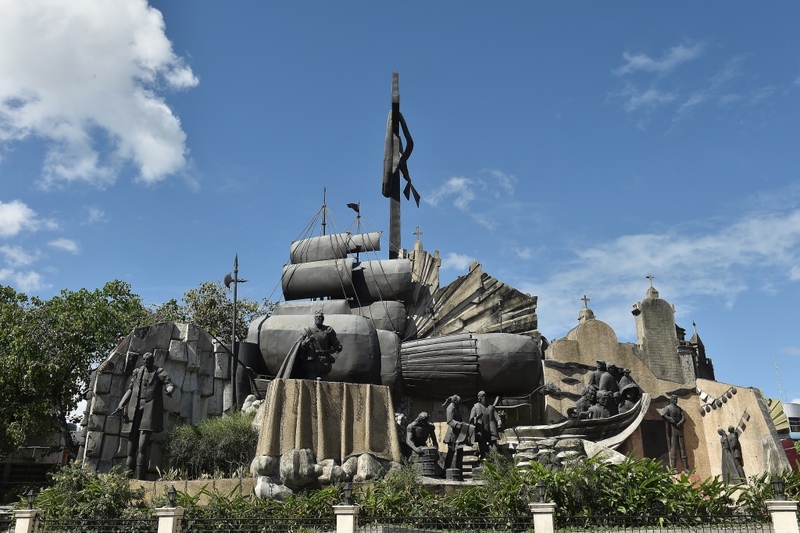 Tacloban City is robust and is like any other big city. 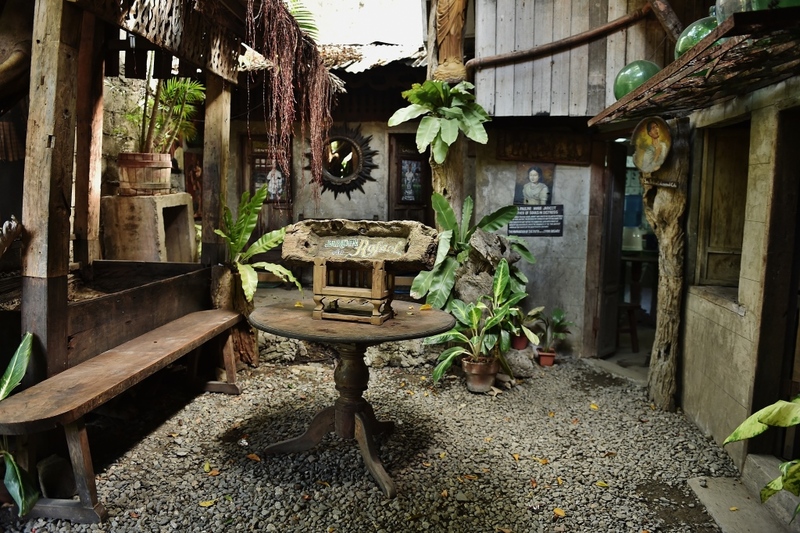 There is a SaveMore, Gaisano, Robinson’s and a host of hotels fit even for the discriminating. On arrival in Tacloban, I was met by members of the rodeo team from nearby Baybay, rodeo players from VSU. Together we found a place I was to go back to on the return trip to Tacloban to fly back to Manila. 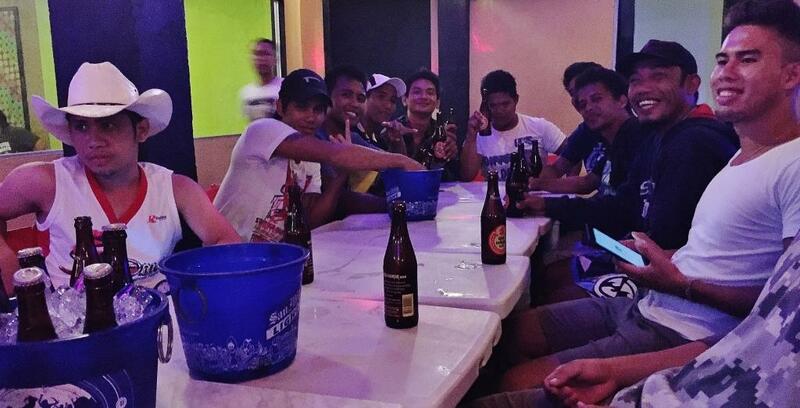 This is now my default drinking place in Tacloban. 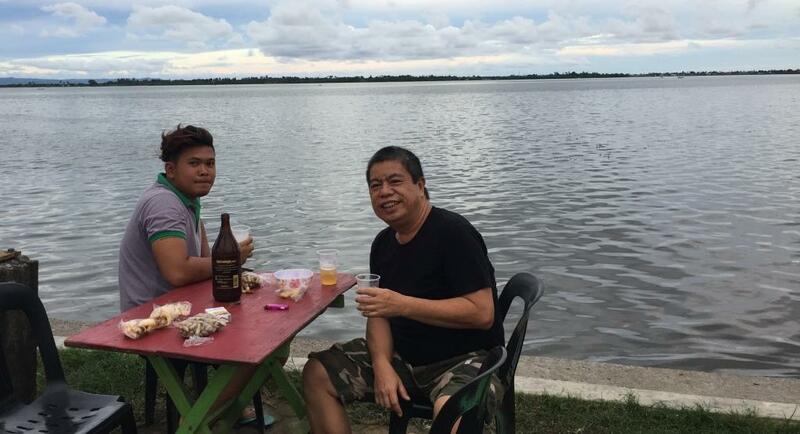 This barbecue area at the end of the road in Magsaysay, near City Hall, attracts foodies and drinkers as the sun is threatening to set. We sat on a table with monobloc chairs as the area was yet being set up. We later on found out that the tables were to be covered with table cloth and an umbrella hoisted. Never mind, we ordered ahead and enjoyed our beer and barbecue a meter away from the water. What a sight. They also sold “puso”, cooked rice wrapped in what looks like pandan leaves so that diners can have rice with their barbecues. We ordered all sorts of barbecues – – pork, squid, innards, etc. The hotel I stayed in was Ironwood and I would rate it high when I go to my tripadvisor account. 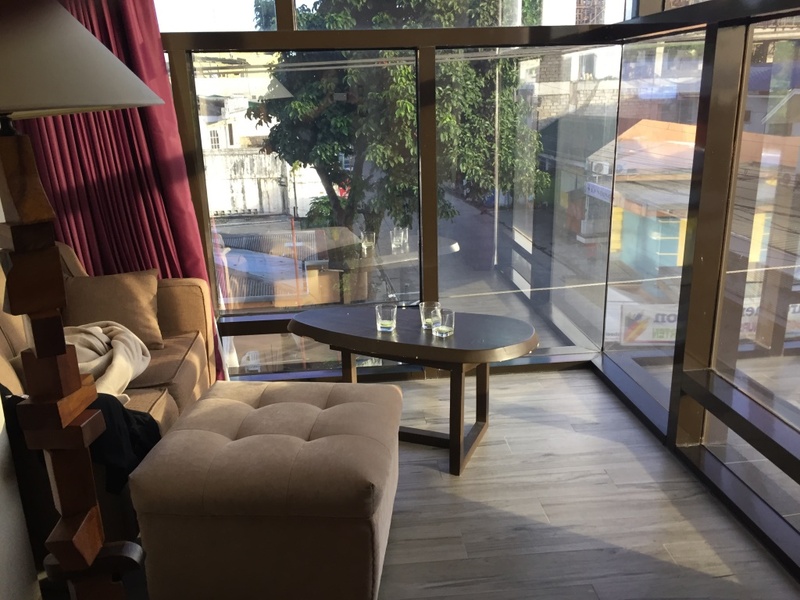 The rooms are nice, the service good, plus the fact that they have an open terrace on the 5th floor where beer and food can also be ordered. 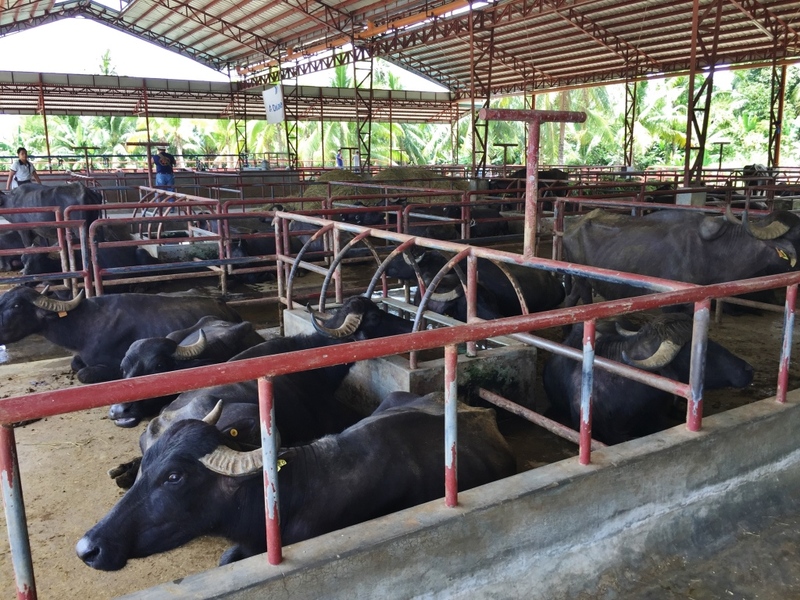 We visited the nearby town of Javier and checked out the Javier Carabao Multiplier Farm. 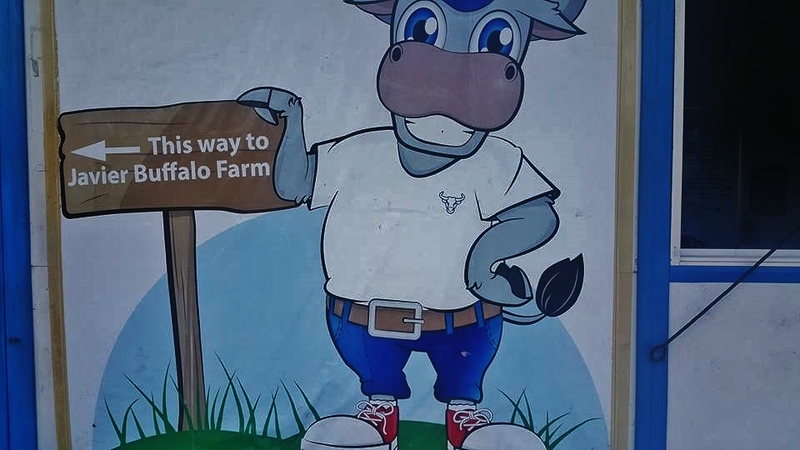 This facility was set up thru the Philippine Carabao Center and the farm produces carabao milk that the workers pasteurize into bottled milk, some with chocolate and also into pastillas. 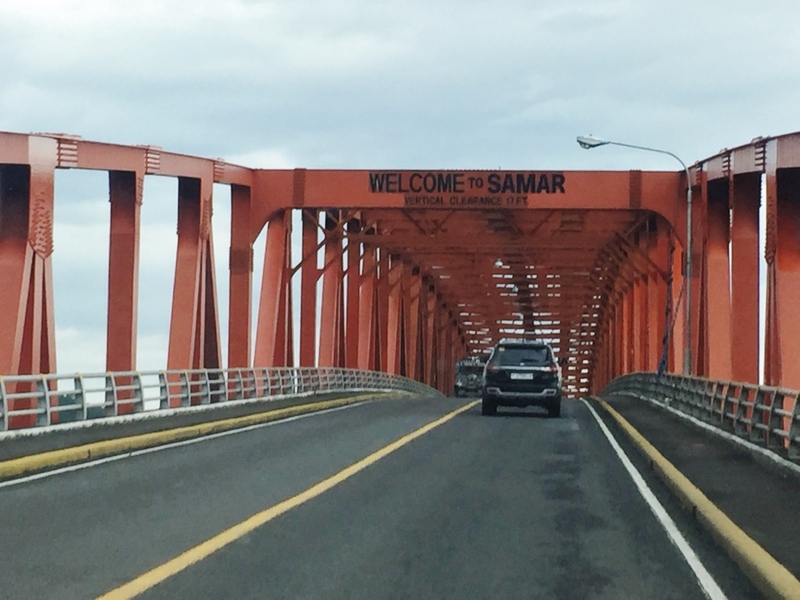 A tour around Tacloban is never complete without San Juanico Bridge. It was rainy but I was lucky to have taken some shots when the sun showed for a brief moment. 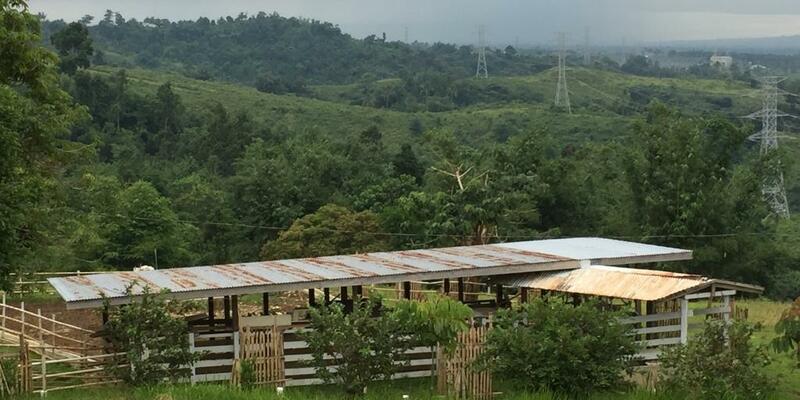 Another farm we visited was Doctor Camenforte’s Farm at the north end of Tacloban. 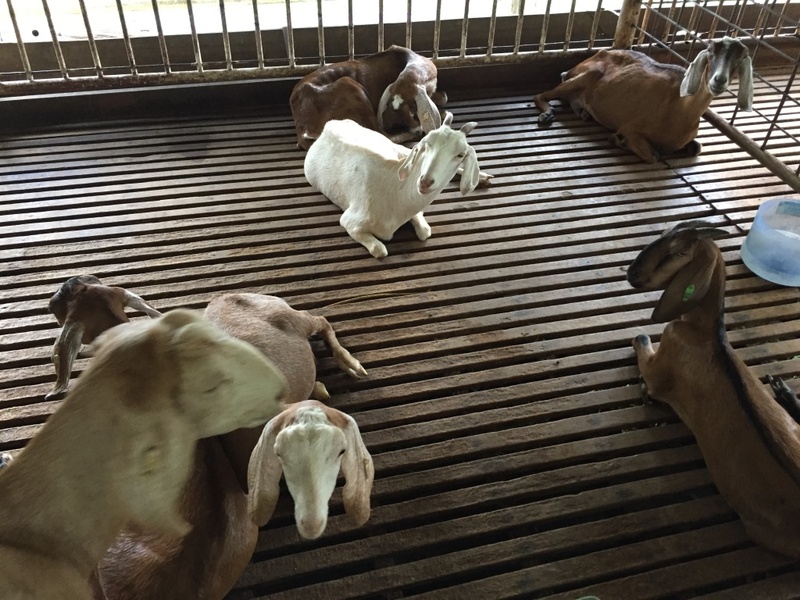 It is an integrated farm with goats, carabaos, ducks, cows etc and is frequently visited by students taking up agriculture or Animal Science. I think a parachute visit into Tacloban is not sufficient and I must return to photograph the other places I missed visitng this time. 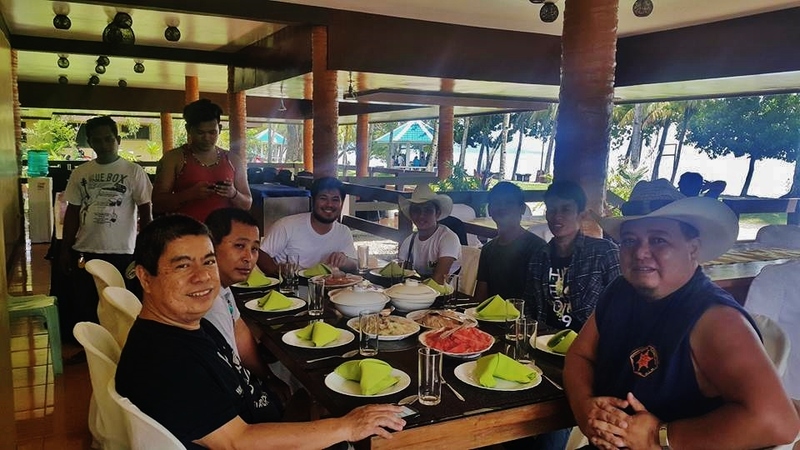 I was invited by the Association of Rodeo Enthusiasts in VISCA (AREV) to visit the team, as a member of the Board of Trustees of Rodeo Masbateno Inc and of VROoM (Volunteer Rodeo officials of Masbate). There were four of us from VROoM, including the Rodeo Director. 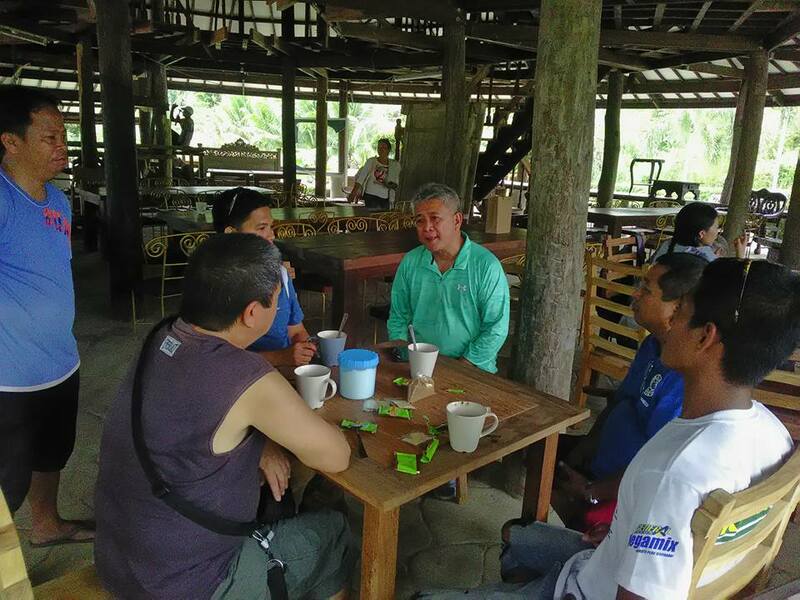 We were welcomed by officers of AREV and their adviser, a professor who is also the head of the Philippine Carabao Center in Leyte. 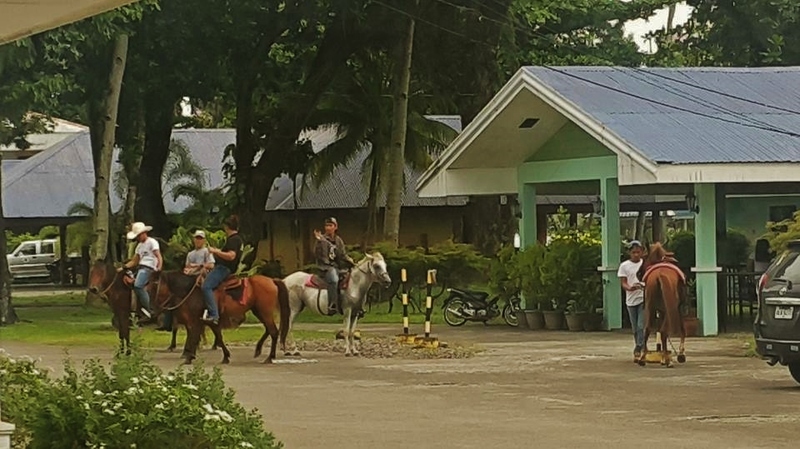 VISCA is the old name of what is now Visayas State University. I have never been inside such a beautiful campus. VSU has a lower campus on the mountain side, complete with a dam and the rodeo team’s rodeo arena. 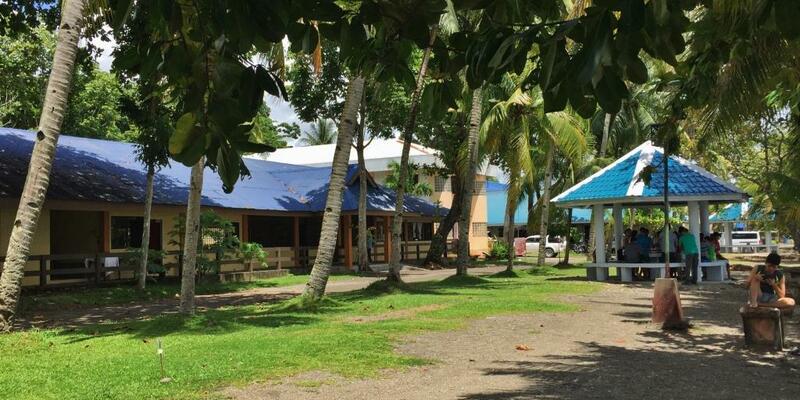 The lower campus doesn’t look like a school campus – – it looks like a beautiful beach resort. 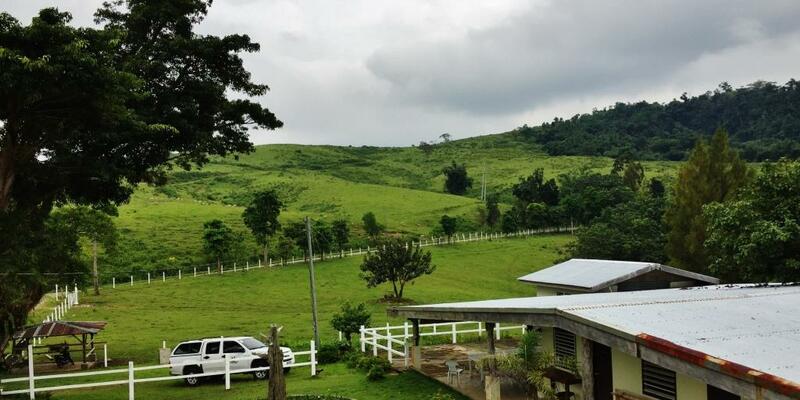 We were hosted in a guest house with hotel amenities – – comfortable bed, aircon, and a nice bathroom. The lounge had sofas and a TV (even if there is TV in the room). Our meals were served, courtesy of our PCC host, at the Guest House that looks like a beautiful seaside restaurant. 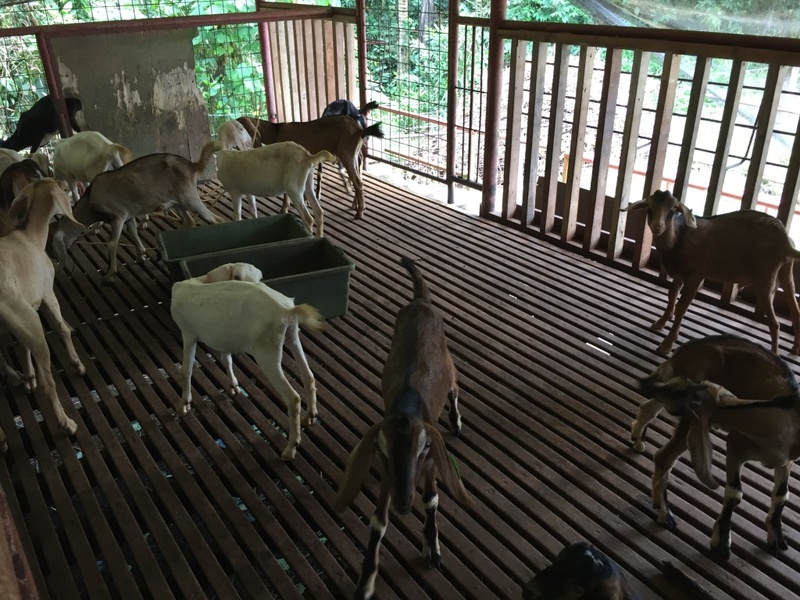 In the evening, we were taken by the team to a local tourism destination still being developed, but already open to visitors. What a sight ogling 16,000 roses up on a hill. 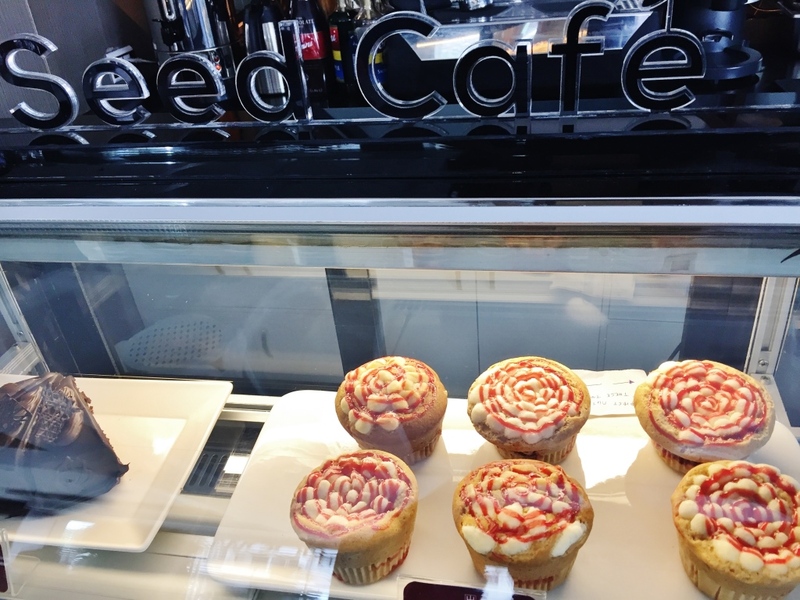 Do not hold your breath, these are not real roses. 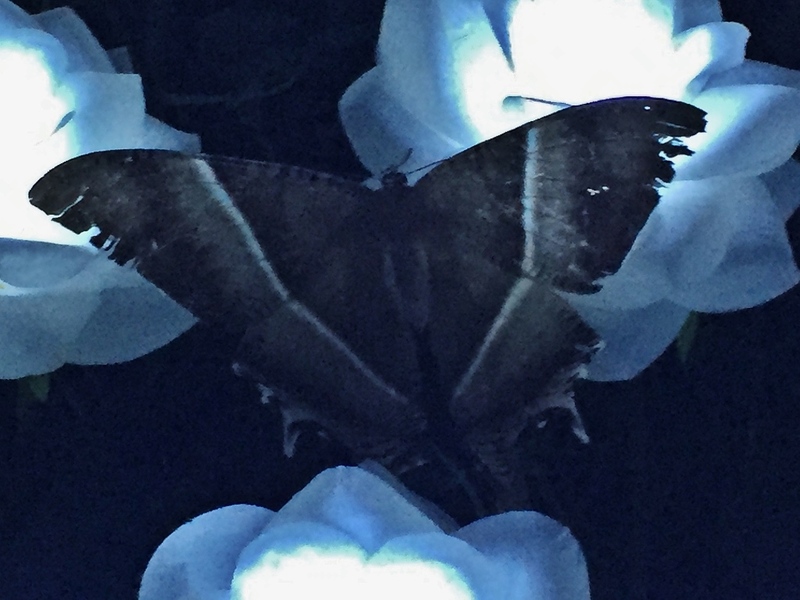 But the concept is so nice that even butterflies probably think the roses are real. The photo below is only half of the 16,000 roses as it is difficult to be walking on steps as I do a pano shot. A drone will be best. 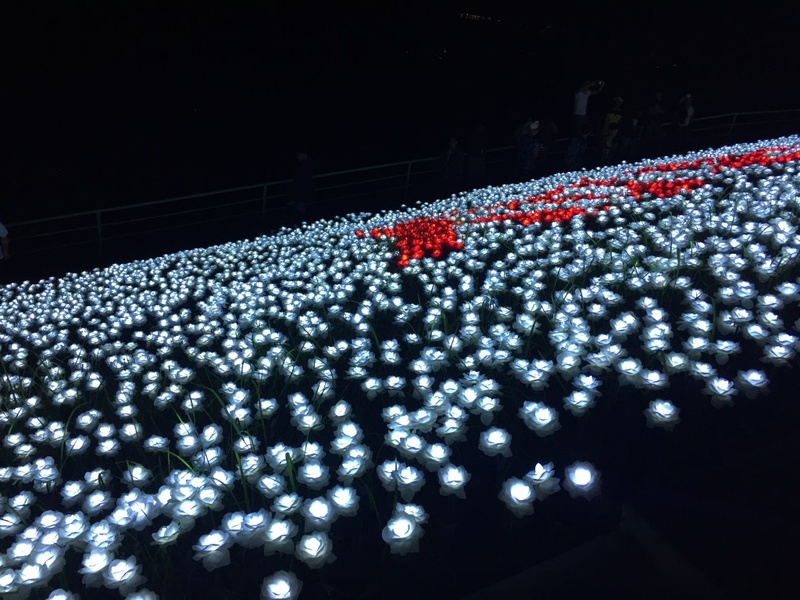 From hill with 16,000 roses, we went with some rodeo players to a local bar with live music, and had beer and music – – – with some moved to dancing by the fun atmosphere. That was captured in a friend’s video which I shall not post here. 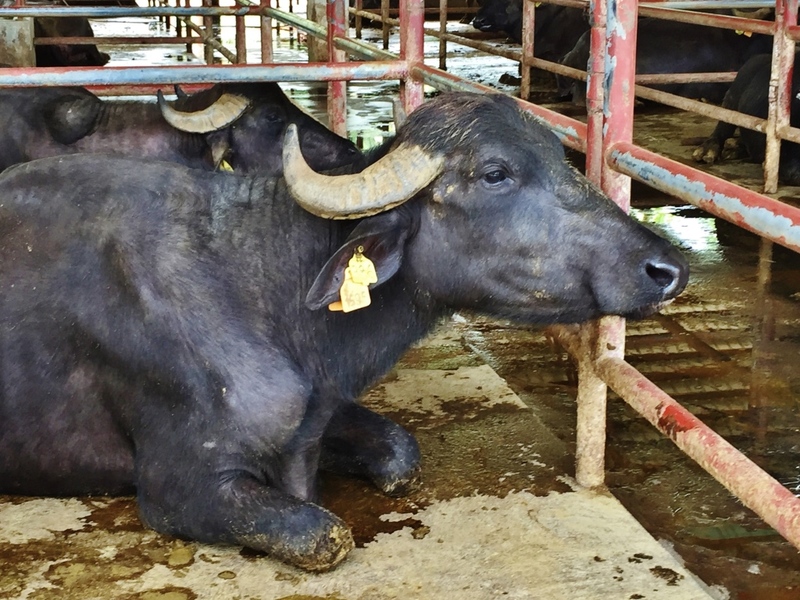 The next day, our host took us to a farm in Ormoc which is a public-private partnership. 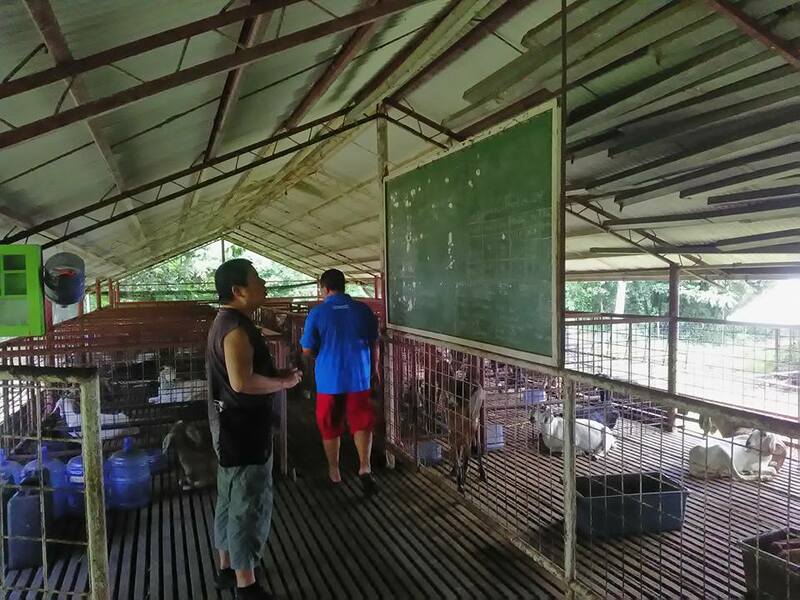 The students from VSU essentially use the MR Farm, owned by the Larrazabal family, for their study- – especially students of Animal Science. The grounds also serve as their practice grounds before competing in big rodeo competitions. 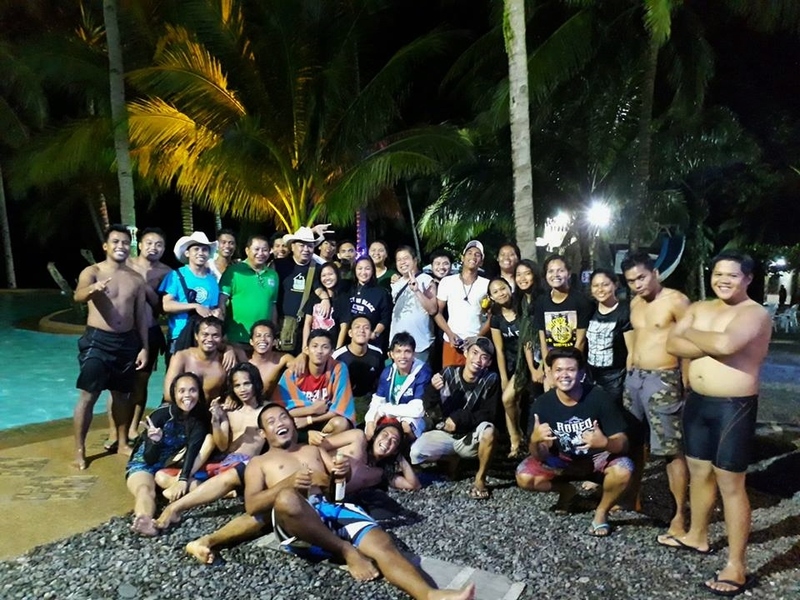 The second day was capped by bonding with the AREV team, all 60+ of them in a team building event at the nearby beach resort called Aqua Azul. As I left VSU and Baybay, the beach campus lingered on my mind. Oh, what a campus ! 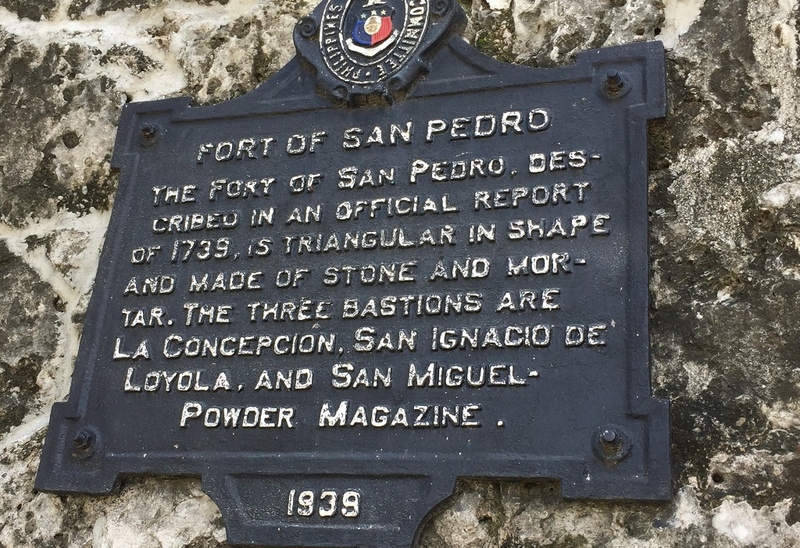 Fort San Pedro, or Fuerza de San Pedro, made of stone and mortar, is the smallest tri-bastion in the Philippines. 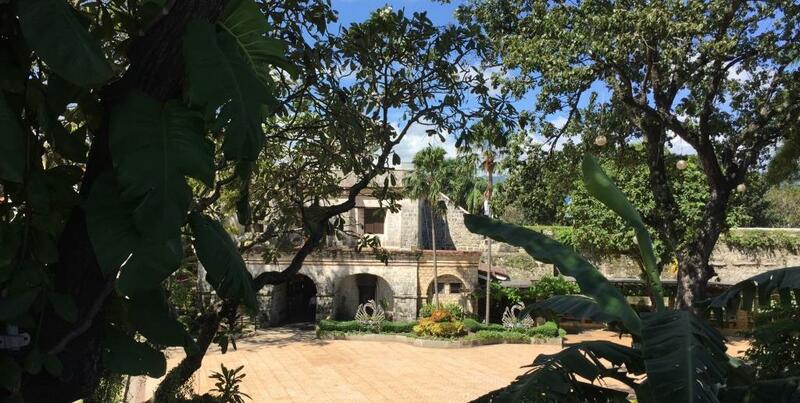 It is a lovely sight, and a “date place” the way the young and the not so young go to Fort Santiago or to the Paco Park in Manila to be with their special someone in a romantic nook. It is a good tour for students of history. 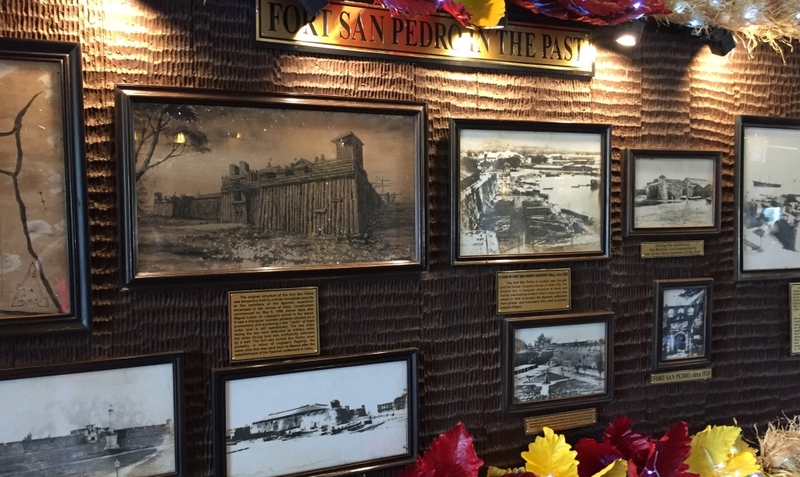 At the entrance cove, one finds photos of the fort in the old days. 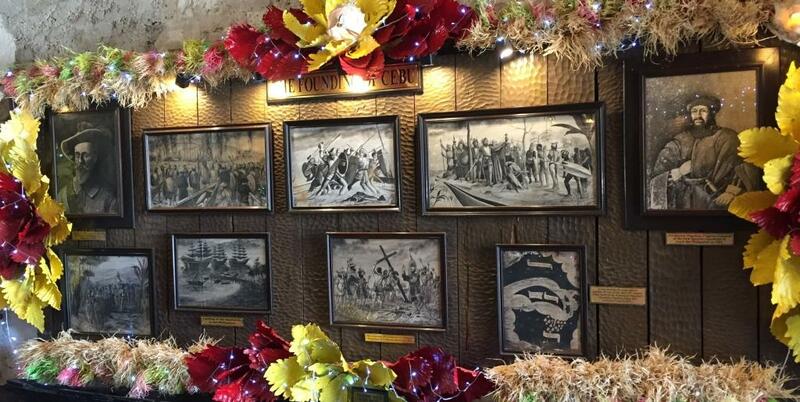 And on another wall are snippets of history relating to the founding of Cebu. 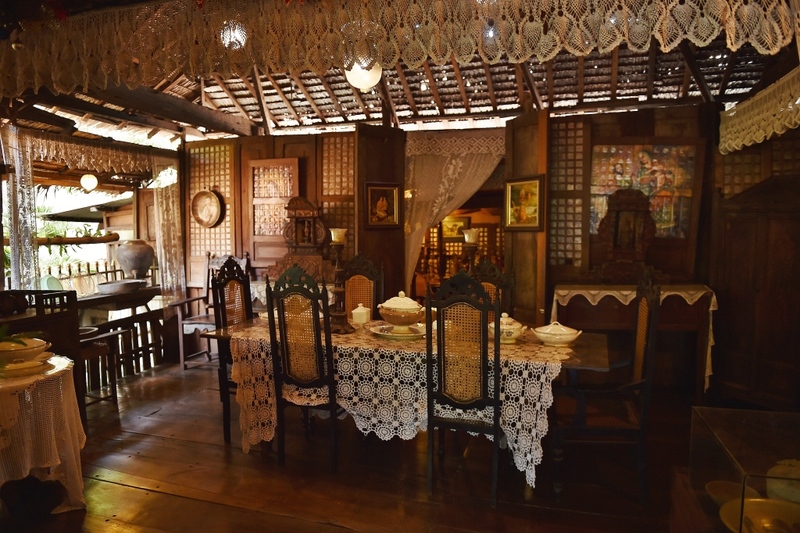 The Yap-Sandiego ancestral house is reputed to be the oldest Chinese house outside of China. 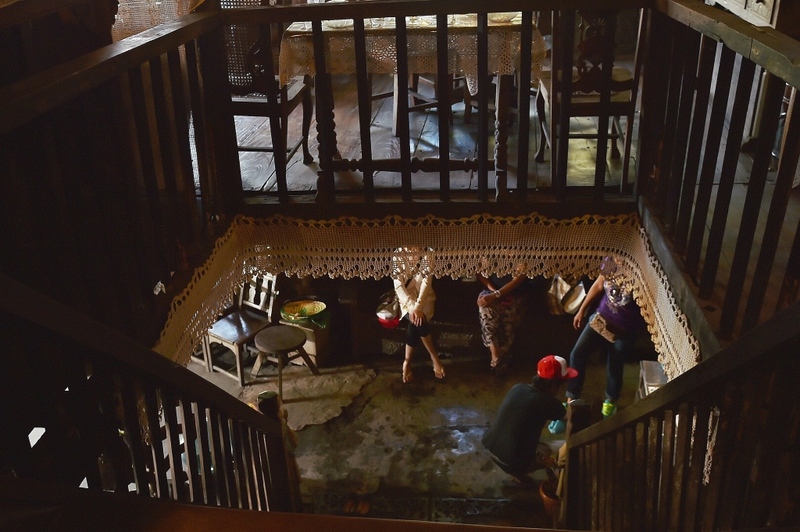 According to the guide who handled our tour, the house was built in the late 17th century at the heart of Parian, then a wealthy community in Cebu. I have seen a lot of ancestral homes in my travels around the country but this one is different in many ways. 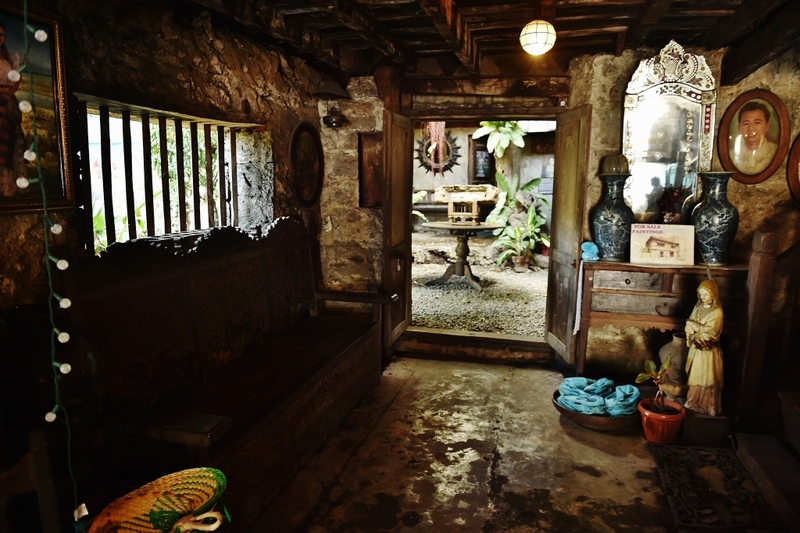 Most of these ancestral homes were built by the wealthy families with Europena/mestizo origins . 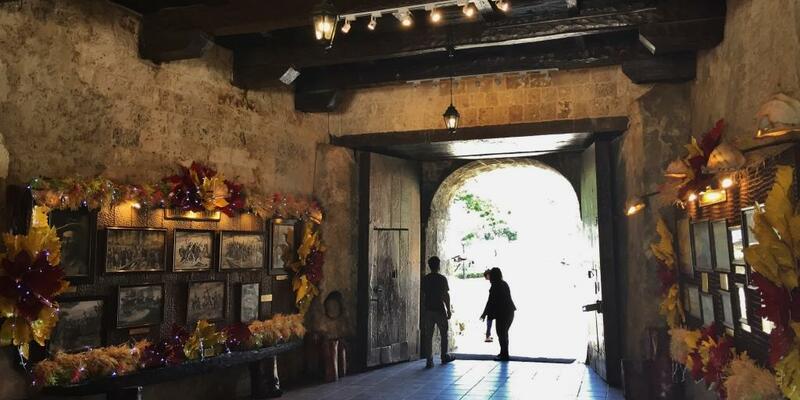 Or they were houses of the biggest owners of farms and haciendas. They all looked like typical European homes. Yap-Sandiego stands out because of the way it was constructed.In fact, it does look and feel like you are in a Chinese movie setting, especially with the brick “tisa” roof – – not the same as the tegula concrete roof cement in today’s modern and affluent homes. 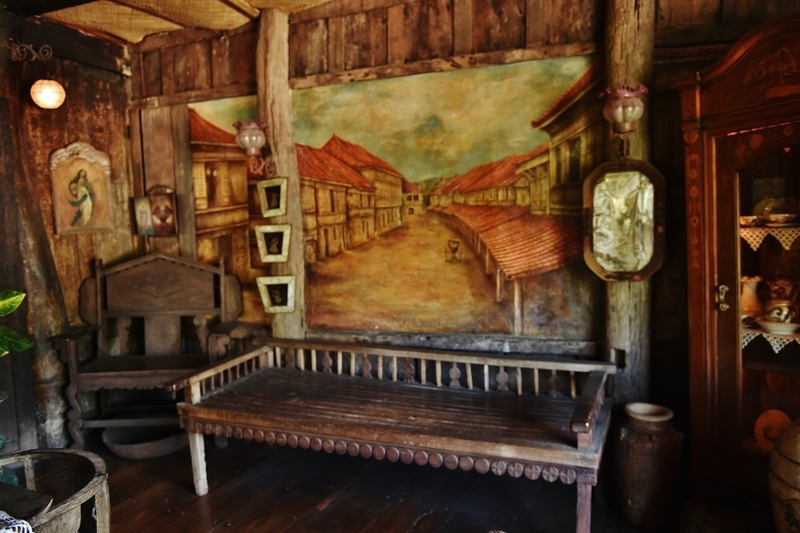 Clay roof and molave hardwood for this ancestral house. 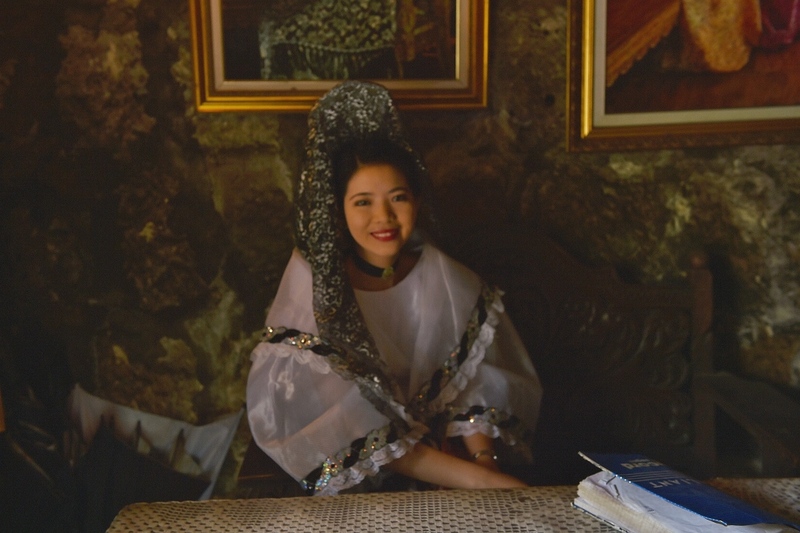 A lady receptionist clad in old Filipiniana dress adds to the aura of this heritage home. 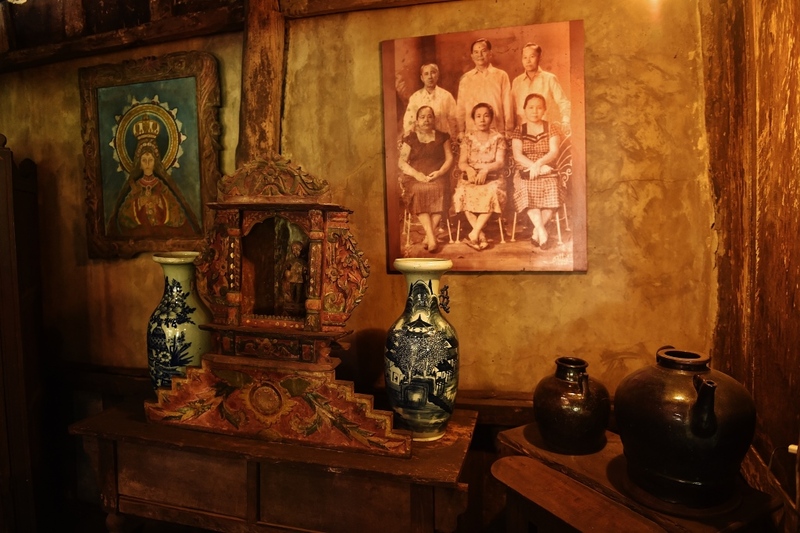 At the ground level, there are ornaments and antiquities that are collections of the present owner of the house, a descendant from the Sandiego branch of the family. 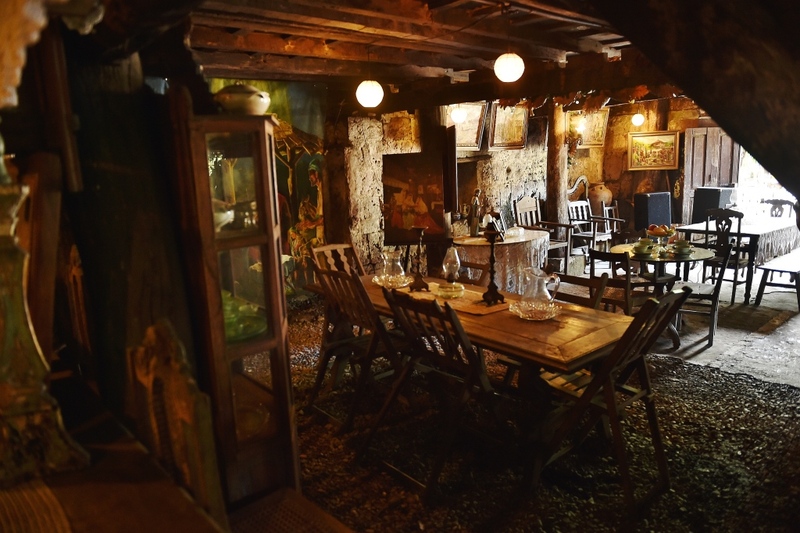 The house is over 300 years old although the antique collections would probably be “younger”. 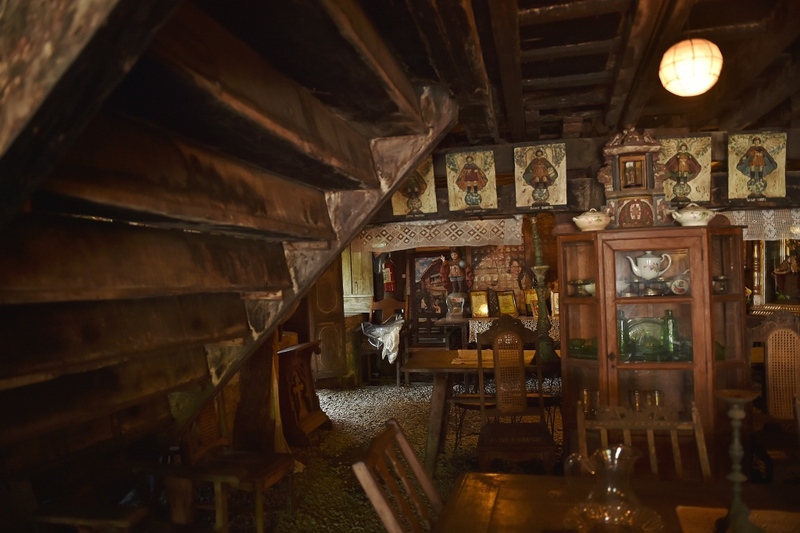 The ground floor is unpaved and contains a lot of period furniture and “santos”. Walking around, my eyes were riveted to the wooden structure that is actually the underside of the stairs. 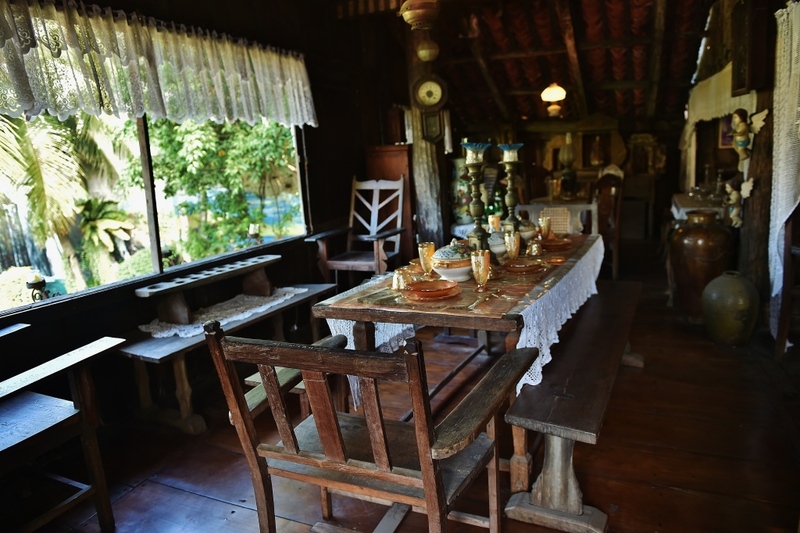 I marvelled at the wood that made up the house – – – molave and other hardwood. Visitors are asked to wear mittens, provided by the guides, to cover their shoes or sandals before being allowed on the second floor. This, the guide says, is to make sure the wooden floors are not damaged nor scratched. The first sign of its age, as I went up the second floor, is the creaking staircase, on the left side going up. Noticing how fragile the structure was, I slowly moved and walked up on the right side where it felt more stable. 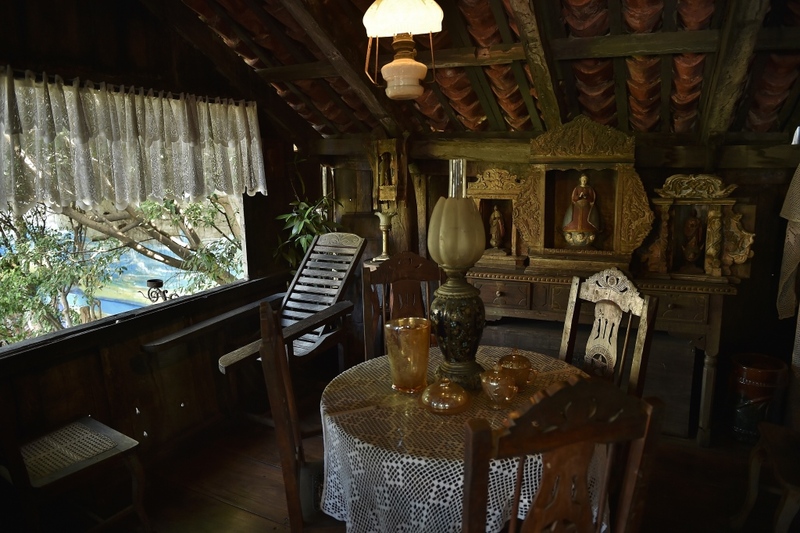 The “banggerahan” , a rack for drinking glasses and cups, catches one’s eyes at the second floor, at the dining area. 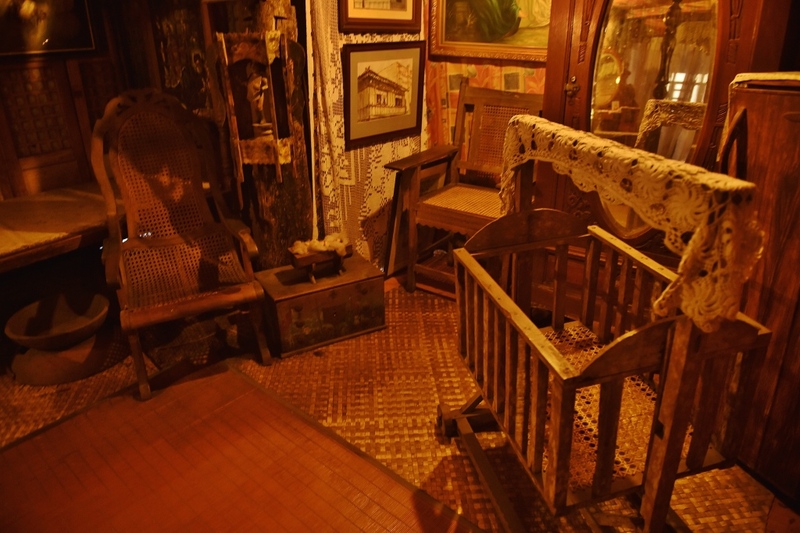 The other focal point is the bedroom with a four-poster bed and a wooden baby crib. 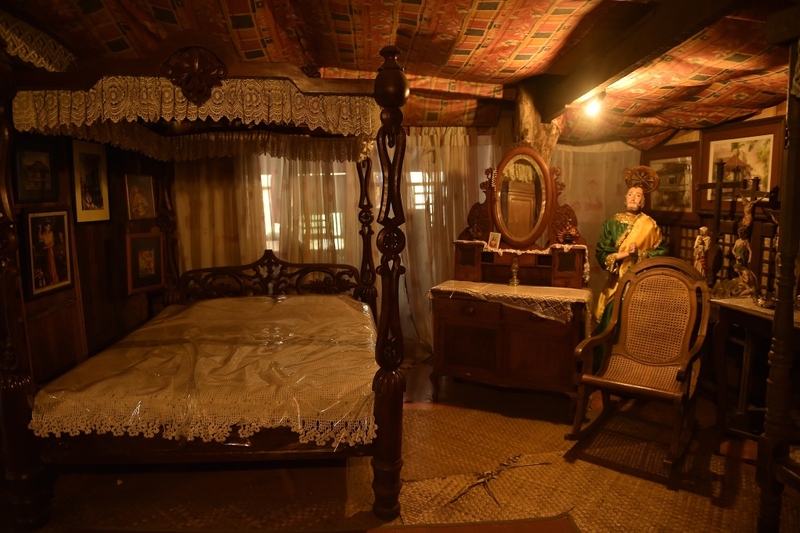 The guide said that even the wealthy Yaps then slept in one and the same bedroom. 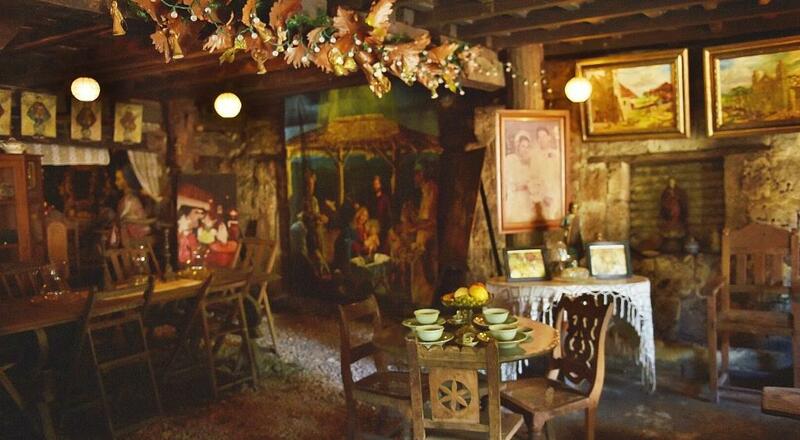 The antique items are collections of the present owner, a descendant of the clan. Old interesting items, but not quite as old and as interesting as the 300+ years old house itself. 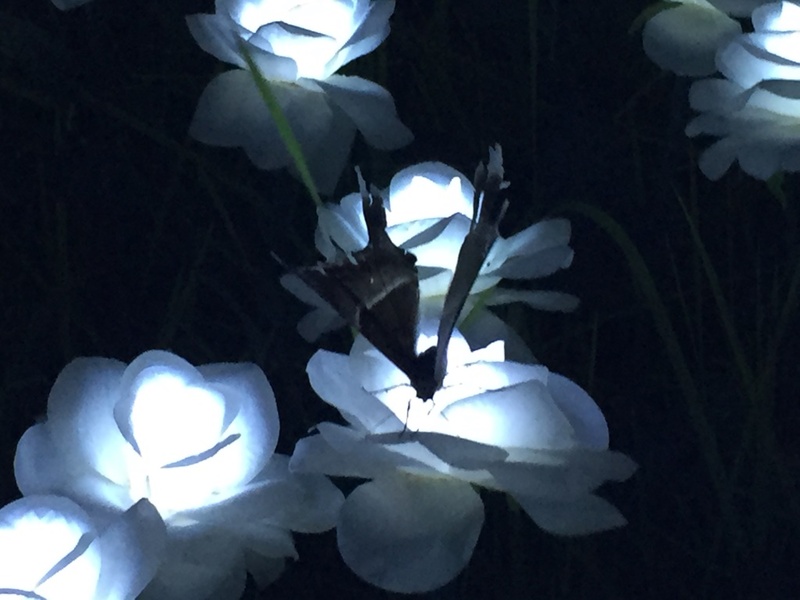 There is a pocket garden where one can catch a glimpse of the house from the sides. It was Christmas season when I visited so the lovely lanterns provided an interesting accent to this heritage home. As I took a photo of the house from the street, an ambulant taho vendor walked by, and an old lady came into the scene. 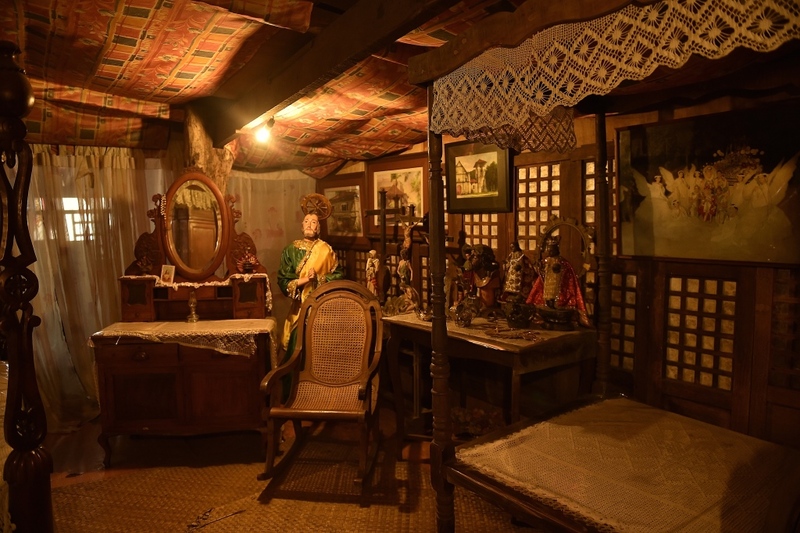 I thought these personalities created for me a scene straight out of the late 17th century when Parian was a bustling Cebu district. 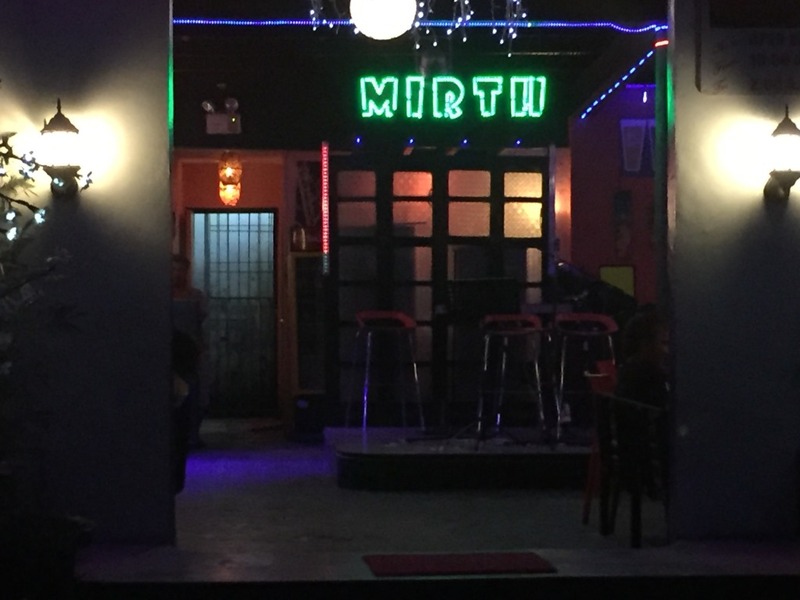 Just outside is a mjor tourist attraction. I am showing it from one side and not posting the other angle because a portion of the mural is damaged. I hope the city fixes that ruined part before you visit. 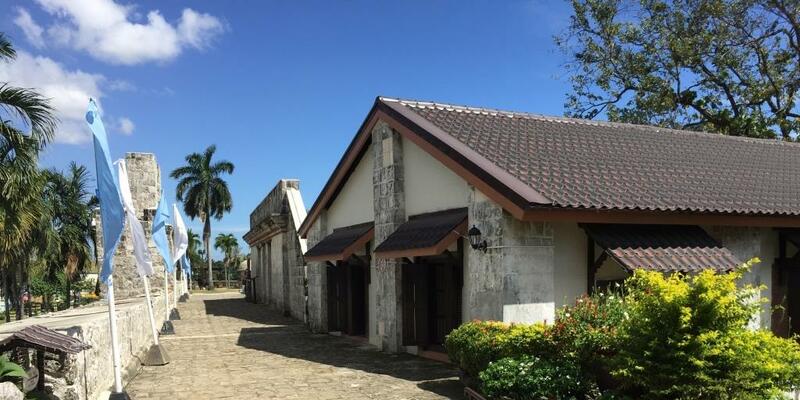 A short turn from the Yap-Sandiego House is the Museo Cebu, but the facility is closed every Sunday. Hail a taxi/cab and tell the driver to take you to Yap-Sandiego at Parian. 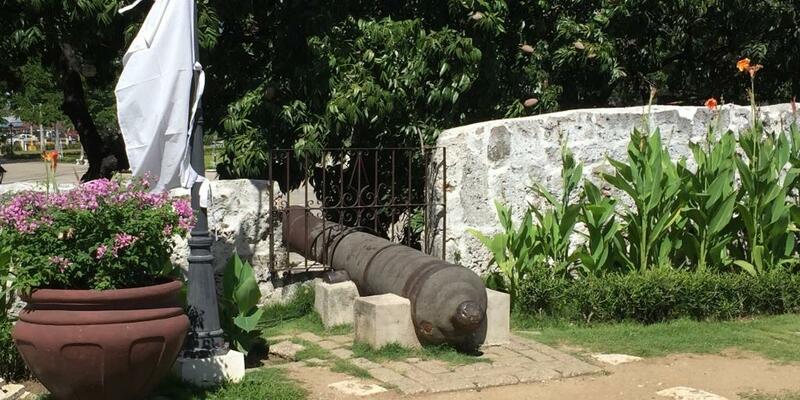 This is such a famous landmark that everyone knows. 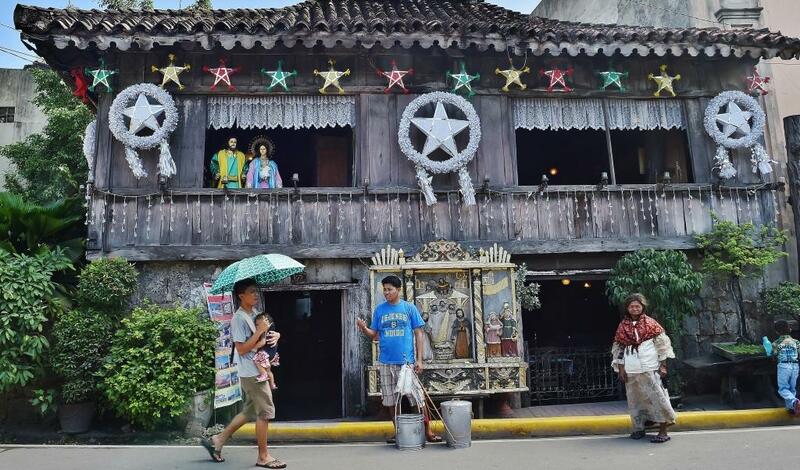 Iloilo is one of the oldest cities in the Philippines, and is home to the most colorful festival honoring the child Jesus, known as the Sto. Nino. 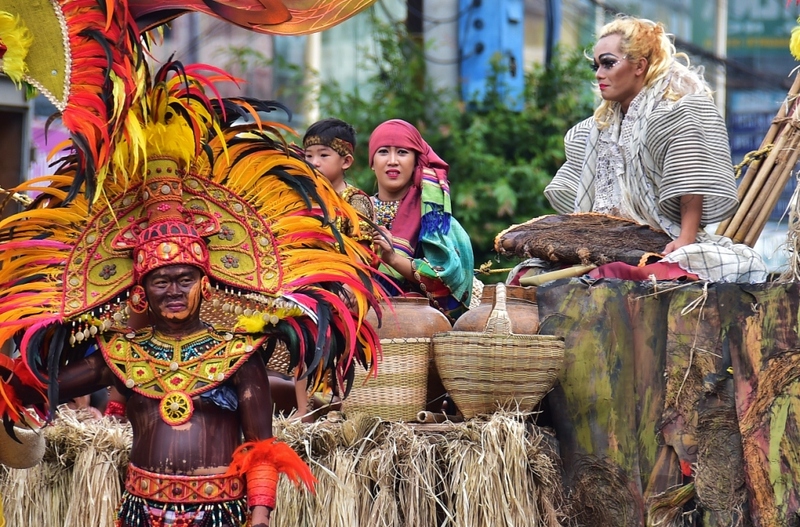 I went there last weekend to join the festivities and to capture the colors and the soul of the event wherein “tribes” from the different towns and cities in Iloilo participate. If one did not know, he will think that the warriors are real tribesmen, what with their bodies painted either black or very dark brown. 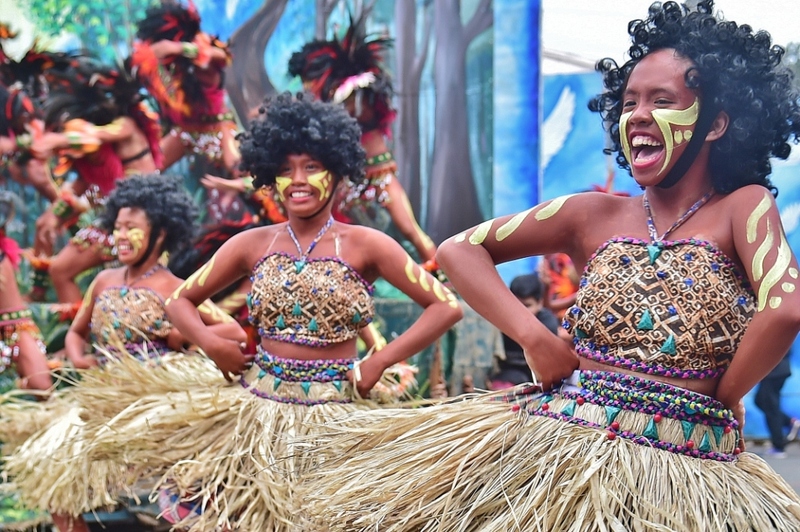 Each contingent is well funded, and donations from the different businesses in their localities fund the elaborate costumes and props. 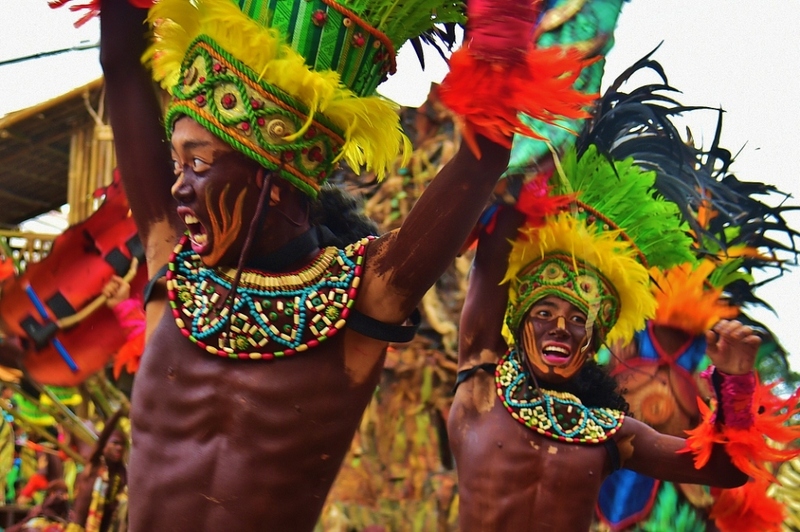 Each of the participating tribes are made up of more or less 500 participants, including the warriors and the ladies, the chieftains and the religious leaders, the musicians on their eardrums-assaulting drums, the propsmen, the barangay officials on parade, and the choreographers and costume designers. 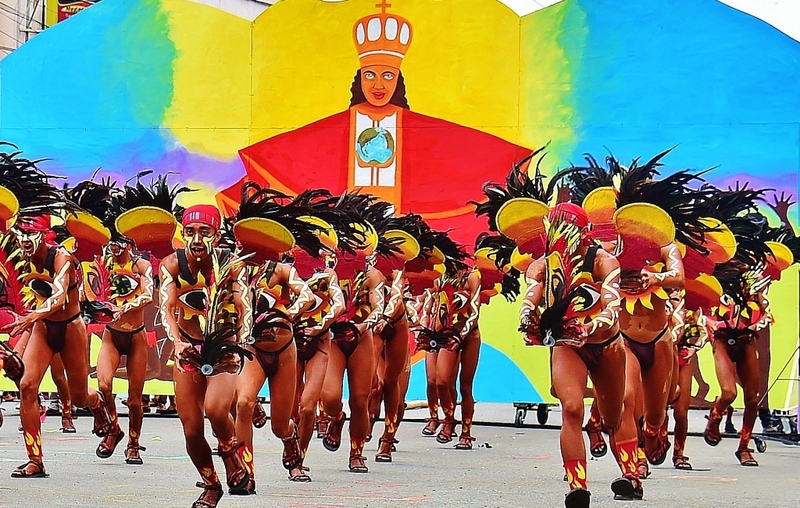 If one has not been to Dinagyang, he will never really appreciate the spectacle, and the scale of the event. The props are huge and mechanized, much like crude versions of props in Broadway productions. And each presentation includes a lot of huge props, one setting for every phase of the 6-minute presentation. 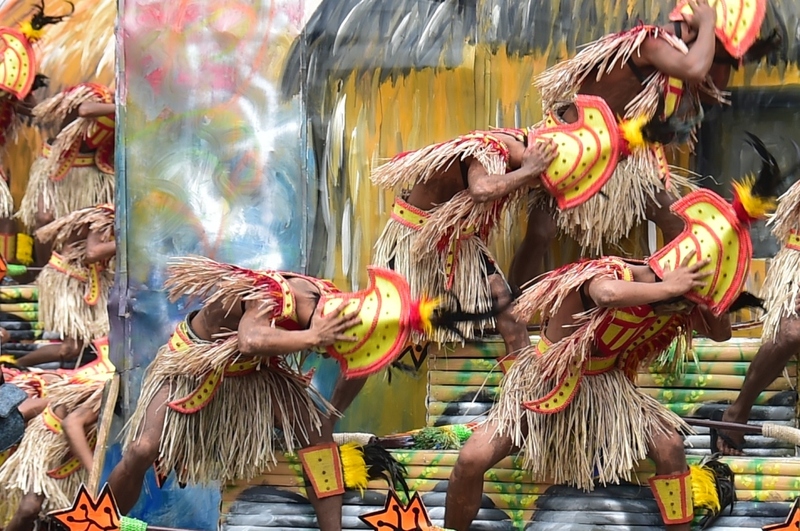 Each of the tribes perform in front of 5 sets of judges on 5 different stages. Thus, photographers and spectators do not have to squeeze into one location and crane their necks. 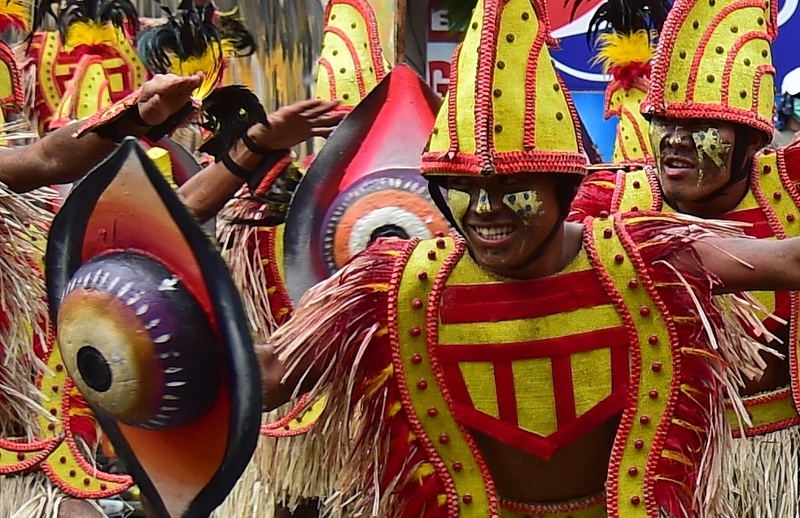 In my years of covering all festivals in the Philippines, Dinagyang stands aout as the most organized. 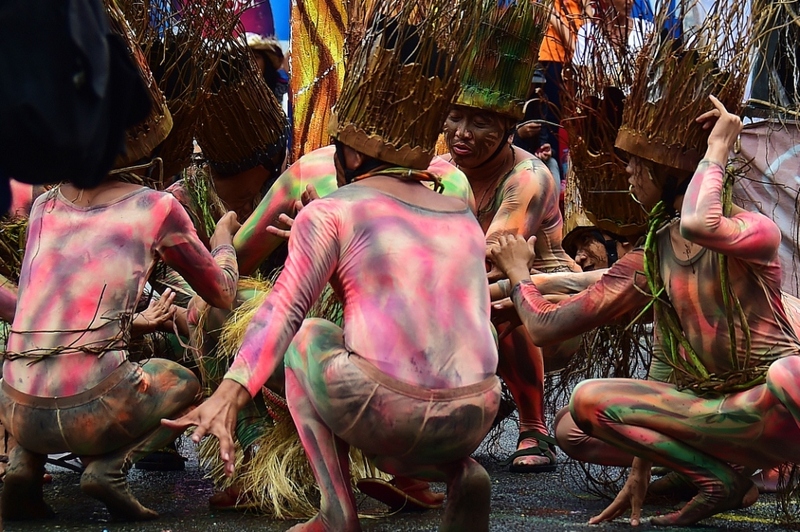 Tribes are given an hour to set up, 6 minutes to perform, and another one minute to exit and proceed to the next stage. 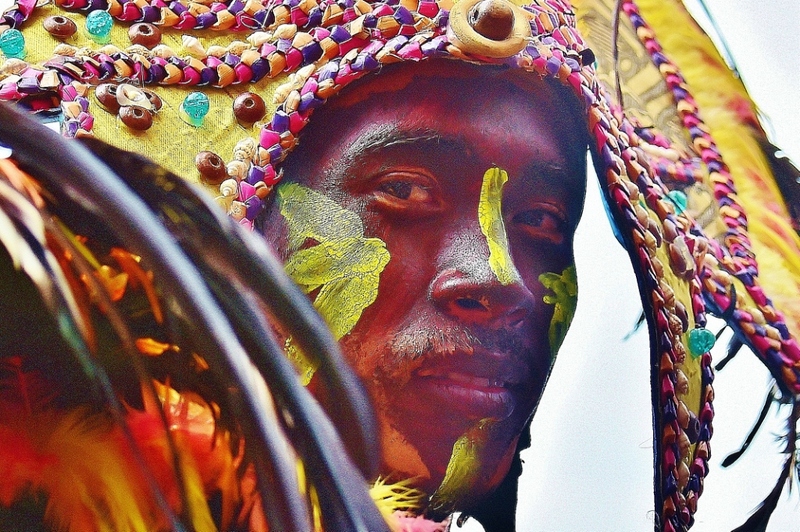 For photography hobbyists, Dinagyang is a must-go-to event. 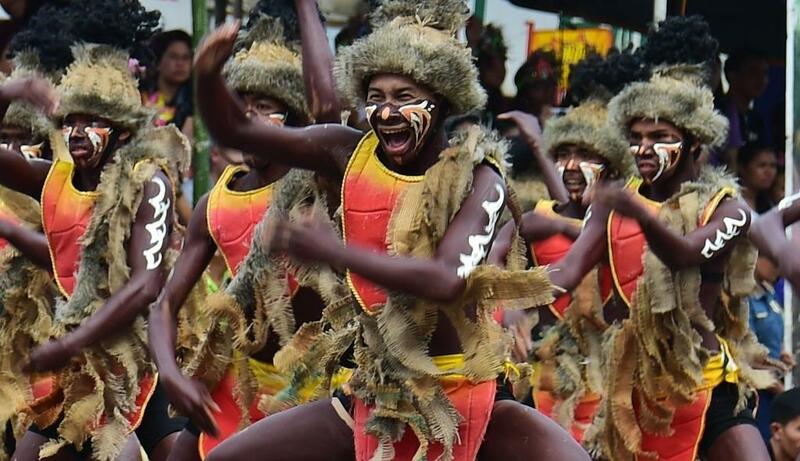 The performers are in their elements, their mouths are wide open when they shout, and their faces tell the story the tribe wants to impart. 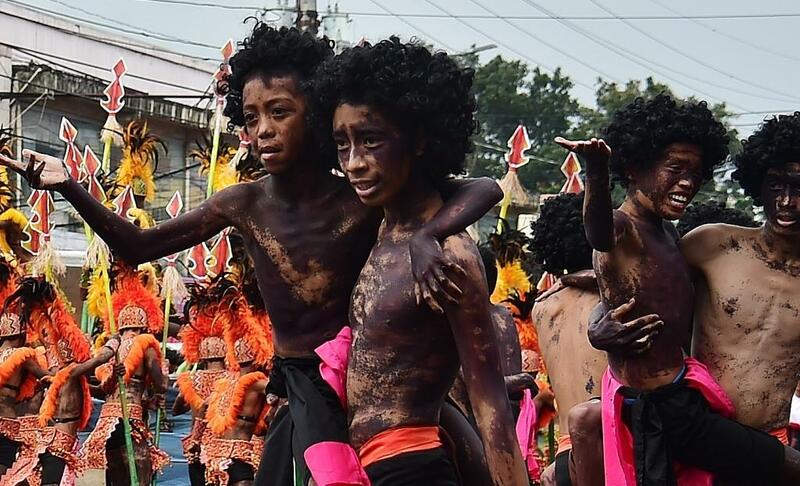 Dinagyang happens every third weekend of January. I strongly urge everyone to go. Book a seat on any one stage for a good view. More importantly, book your hotel as early as 2 months ahead, or one month ahead at the latest. And make sure you book your flight or your boat trip ahead, too. 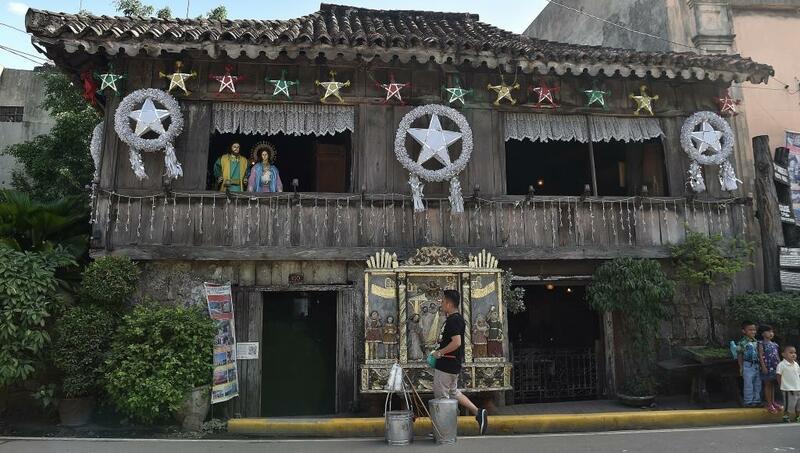 A good way of not missing the trip is to book well ahead and visit the ancestral homes and old churches around Iloilo. 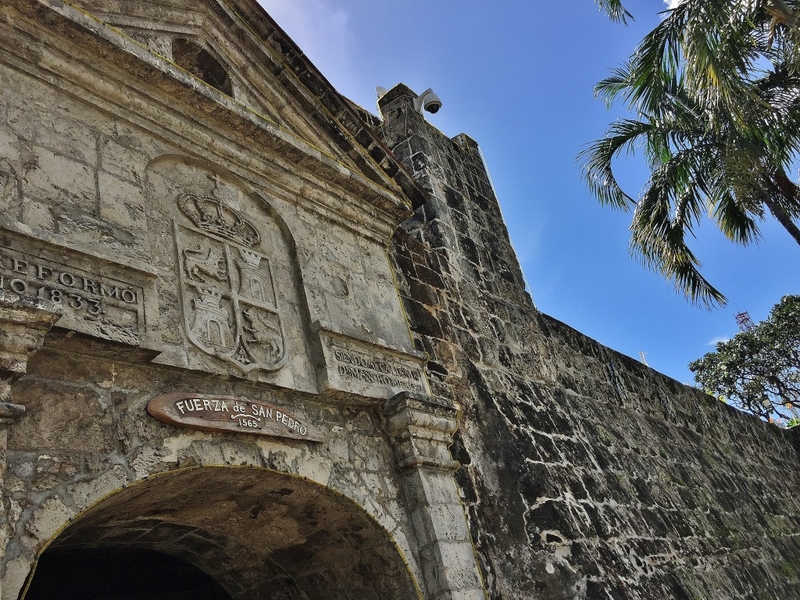 The three most notable churches one should not miss are Miag-ao, the church in Molo, and the church in Jaro. 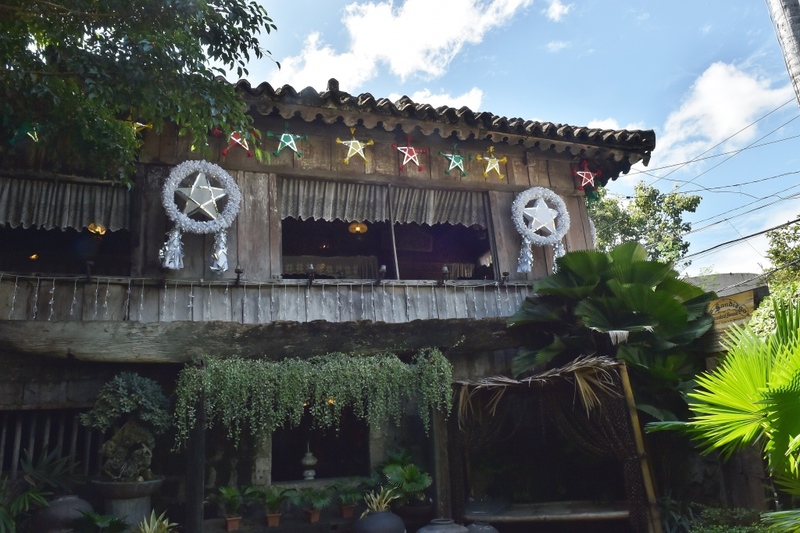 Visit, too, the Balay nga Bato where your entrance fee includes a biscocho snack with hot thick chocolates. 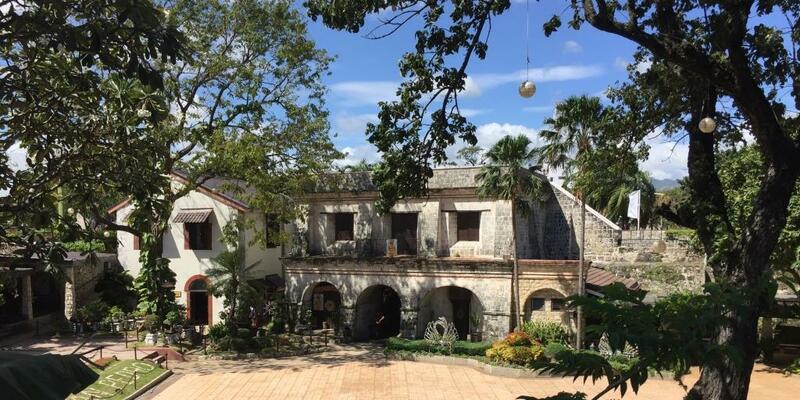 There are many hotel in Iloilo. 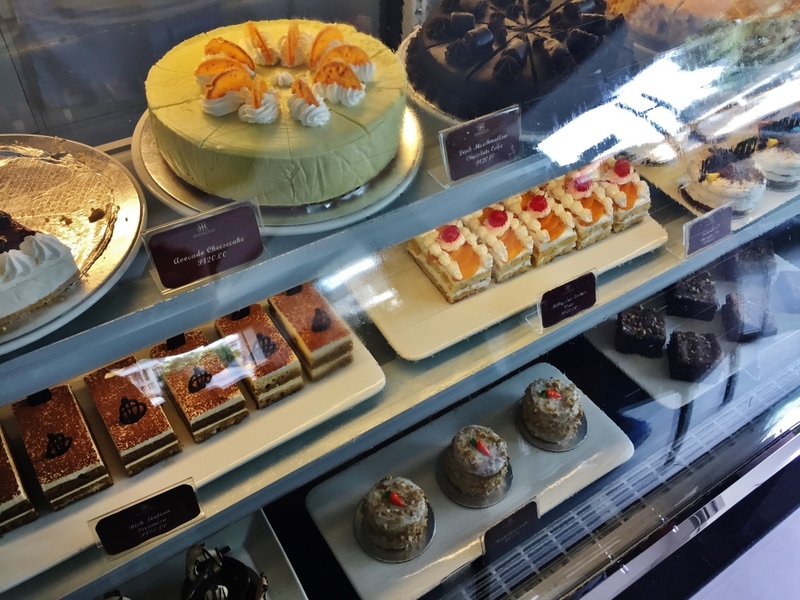 My top 3 choices are Amigo Terrace (refurbished) at the city center, the good old Sarabia Manor, and the very clean Grand Dame (if you don’t mind a public market right by your doorsteps). I shall write about these churches and other destinations and show photos and contact details of these hotels on another day on this same blog page.